Spring 2019 classes will begin on Tuesday, March 5. Program manager Laura Walker is scheduling a record number of classes, and our crew of instructors is ready to go! Watch this space for more details and stories as the season progresses! 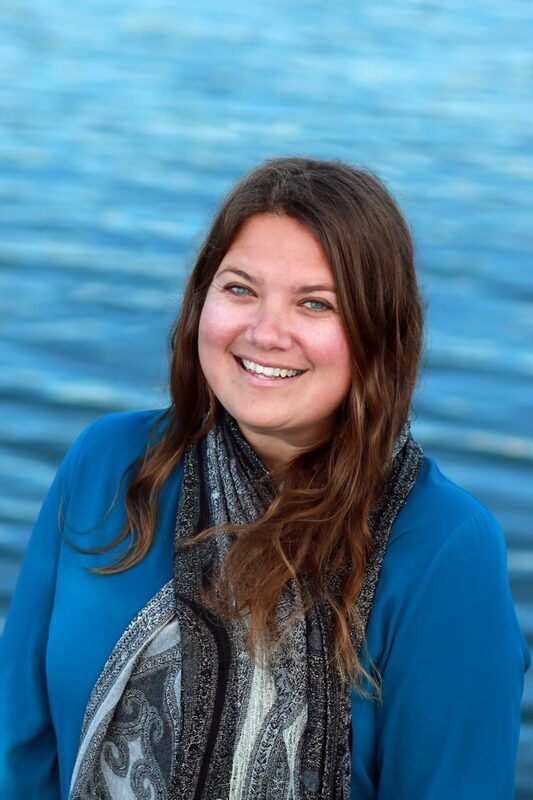 On January 15, 2019, Rachel Kippen will begin work as Assistant Executive Director for O’Neill Sea Odyssey and when Executive Director Dan Haifley retires on March 20 she will assume leadership of the organization, which was founded in 1996 by Jack and Tim O’Neill and has provided free, ocean-going science and environmental education for more than 100,000 youth. Rachel Kippen is an environmental advocate and artist. With her experience as Director of Programs at Save Our Shores and her tenure coordinating environmental initiatives at the City of Watsonville, she understands regional priorities for environmental education and the effort to stem ocean pollution, 80% of which comes from land via rivers and storm drains, or blown by wind. Kippen’s background also includes experience increasing public accessibility to complex science and conservation research at the California Academy of Sciences and work as an environmental educator at the Marine Science Institute on San Francisco Bay, The Wetlands Institute, and Catalina Island Marine Institute. Ms. Kippen holds a Bachelor’s degree in Environmental Studies from University of Redlands and a Certificate in Strategic Leadership and Nonprofit Management from San Francisco State University, and has focused her graduate research in environmental justice education through place and arts-based curriculum development, primarily in agricultural and immigrant communities. Of mixed cultural heritage including Hawai’ian, Rachel endeavors to create inclusive educational opportunities for youth that incorporate diverse perspectives and are representative of the dynamic community she serves. In her free time, Rachel enjoys creating artwork from plastic pollution and spending time on the water with friends and loved ones. This year the Lighthouse Lighting will take place at 5:30 PM on Saturday, December 1, just before the Santa Cruz Yacht Club’s Lighted Boat Parade. Support from Lighthouse Lighting sponsors PG&E, Devcon Construction, Bill and Brigid Simpkins, System Studies Team Giving, Lighthouse Bank and the Santa Cruz Harbor will benefit O’Neill Sea Odyssey’s free, ocean-going science and stewardship program for area elementary school students. 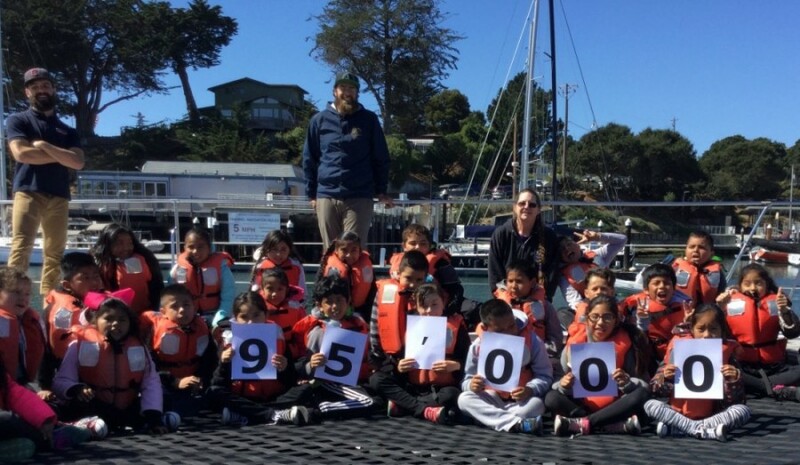 Stephanie Martinez’ fifth grade class at Live Oak Elementary School in Santa Cruz will include O’Neill Sea Odyssey’s 100,000th student at noon on Thursday, September 27, 2018. What started as Jack O’Neill’s idea to get students on the ocean in order to learn to protect it has become a high-quality science and environment education program run by a talented team. I want to thank our staff, Board of Directors, volunteers and donors for getting us this far. Now, to the next 100,000! We especially want thank the Basuino-Souza Group of Merrill Lynch for sponsoring the 100,000th student campaign. On Saturday, September 22, 2018 from 7 AM to 4 PM at the Santa Cruz County Government Center Parking lot at 701 Ocean Street, Santa Cruz Dub’n will hold their first Santa Cruz-based classic VW show. Volkswagen enthusiasts from all over are expected to attend, and even if you just want to check out the scene, it’s a fun way to spend part of a Saturday. Tickets are $30 to show a vehicle, $50 to participate in the swap meet of VW parts, and free if you want to just walk in and enjoy the show. To get tickets, go to Facebook and search “Santa Cruz Dub’n – VW Car Show”. We hope to see you there! After a summer of preparation, our 2018-19 school year will start with a class from Monterey Park school in Salinas on the morning of September 11. This fall, we will serve our 100,000th student, and Cyndi Dawson will start a three month transition as Assistant Executive Director before she becomes Executive Director on January 1, 2019. I will continue in my role as Executive Director until then. In the meantime several projects, including the organization’s 2019-2023 Five Year Strategic Plan and the christening of the Jack O’Neill & Harry Hind Education Center, will be completed this year. Making O’Neill Sea Odyssey work is a complex proposition that takes a very dedicated and competent team, including our staff, volunteers, donors and our Board of Directors. I am grateful to them every day. Onward! We have a (student art contest) winner! 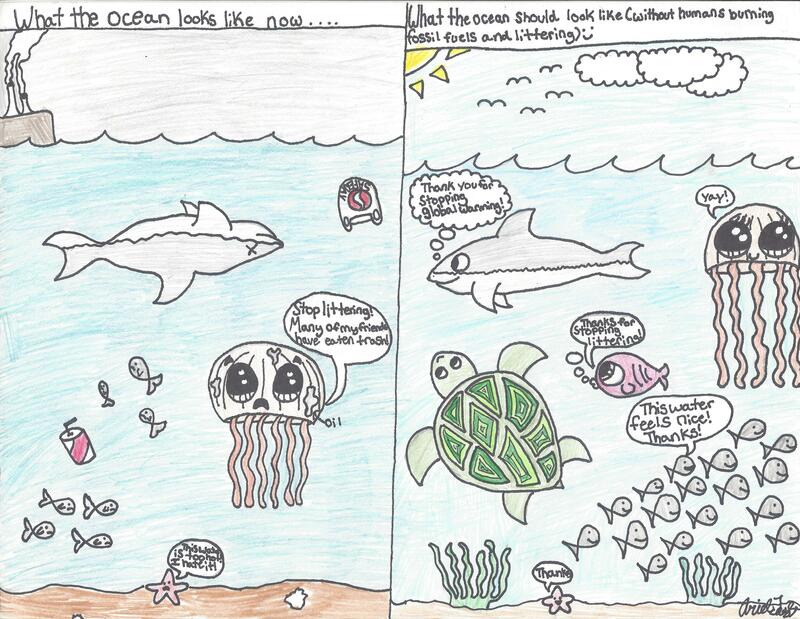 Congratulations to Mateusz Niemiec, a 6th grader from Scotts Valley Middle School, CA, as the grand prize winner of the 2017-2018 Ocean Steward Art contest. 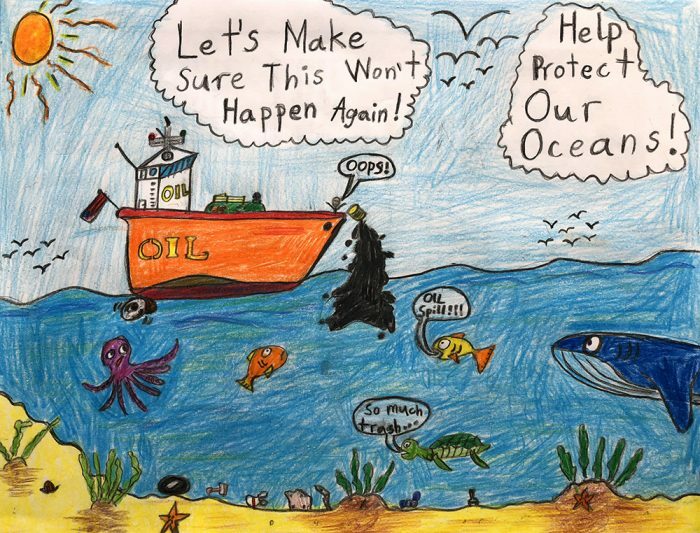 O’Neill Sea Odyssey and its Board of Directors selected Mateusz’s original color pencil artwork “Protect Our Oceans” which depicts an oil tanker spilling oil into the ocean. The effects of oil are catastrophic to marine life and the ocean environment. Raising awareness about oil spills and reducing our reliance on oil is an important message. Mateusz and his teacher, Renae Fish, will each receive family passes for a one hour public sail aboard the Team O’Neill catamaran. In honor of Mateusz and his award winning piece, O’Neill Sea Odyssey will present an enlarged mounted copy of the artwork to both Scotts Valley Middle School and the City of Scotts Valley, who provided funding for Ms. Fish’s class. 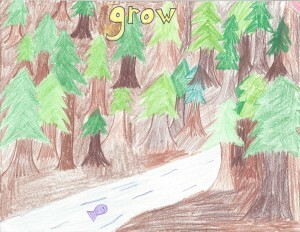 The eight honorable mention winners include: Jason Hsu (grade 5) of G. W. Helleyer Elementary School, Isabella Morairty (grade 4) of Vine Hill Elementary, Sofia Grigg (grade 6) of Scotts Valley Middle School, Sishira A.V. 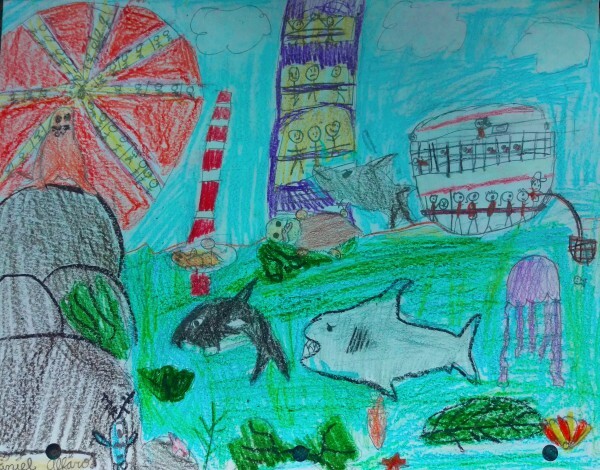 (grade 5) of Lynhaven School, Donovan Ferreira (grade 4) of Westwood Elementary, Marley Chavez-Silva, Samantha Politron and Gizelle Huerta-Orduño (grade 4) of Santa Lucia Elementary, King City, CA. These eight students will all receive accolades as O’Neill Sea Odyssey Ocean Stewards and their artwork will be exhibited in the OSO classrooms. In the 1950s, Jack O’Neill lived and worked in San Francisco, where he often surfed at Kelly’s Cove, at the north end of Ocean Beach. There, he met Harry Hind. The two became life-long friends, surfing together and occasionally collaborating on various projects. When Jack and Harry donated the building to O’Neill Sea Odyssey, an ocean-going science and environment program for elementary school children, there were four years left on its lease with the Santa Cruz Harbor. Initial efforts by O’Neill Sea Odyssey to obtain a new lease were unsuccessful. But, as the result of fundraising for building renovations and an open door to a negotiation with the Santa Cruz Harbor to develop a new lease thanks to then-Port Director Brian Foss, our non-profit organization took the upstairs of the building and the harbor took the downstairs, for a period to end on December 31, 2028. Today the structure houses an education center operated by O’Neill Sea Odyssey, a free, ocean-going science and environmental program for elementary schools that also uses the Team O’Neill sailing catamaran as an ocean classroom. 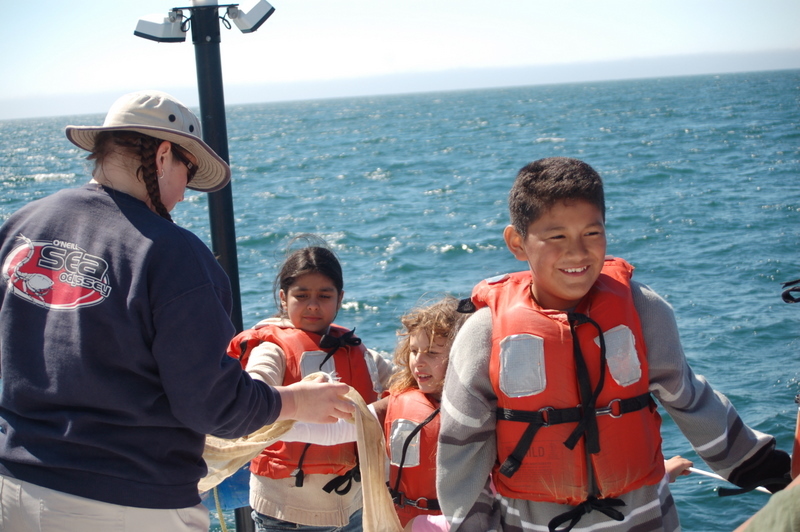 The hands-on science program has environmental outcomes and serves 4th-6th grade students from schools in Monterey Bay and surrounding areas. The Daniels family have generously supported the program since Harry Hind passed away in 2012, in tribute to his life-long friendship with Jack, who passed away in 2017. Leslie Daniels, Harry’s daughter, and her husband, Troy, have made two generous gifts to establish the Jack O’Neill and Harry Hind Endowment Fund at the Community Foundation for Monterey County. Earnings from the fund will help to support O’Neill Sea Odyssey in perpetuity. A small ceremony in mid-September will officially christen the education center as the “Jack O’Neill & Harry Hind Education Center”. As Summer melts into Fall, O’Neill Sea Odyssey is getting ready for the beginning of the 2018-2019 school year. The first day that classes will be served is September 11, and Program Manager Laura Walker is working with classroom teachers to schedule classes for the Fall season. There’s alot that goes into that project: working with calendars, arranging approvals for bus transportation scholarships, reviewing each class’ plans for its community service project, and delivering classroom curriculum to every classroom that’s been approved for a field trip. There are also the details: some new life jackets, cleaning the education center, and getting new classroom supplies. Overall, we’ll have a capacity to serve 211 classes this year. A big thank you in advance to those who make this happen: our staff, our Board of Directors, our volunteers, and our donors. Here’s to another year of a living classroom on Monterey Bay! With today’s class from The Spot Camp, the last of the school year, OSO has served 5,349 students in 208 classes since July 1, 2017. The grand total since the program began is 99,388 students, meaning that we will serve our 100,000th student in September. The 2017-2018 school year was a good one and, after we get Applied Survey Research’s analysis of this years student and teacher survey results, we’ll have a better handle on the depth of our impact on those 5,349 students, who also performed 208 community service projects. To help them get to our facility, we spent $55,960.31 on bus transportation for 90 classes from lower income schools. It was also a good year because we started using our new Next Generation Science Standards-aligned curriculum for use in the classrooms of the schools that use our program as well as schools nation-wide, we had some new instructors join our ranks including two OSO alumni, and we built our social media presence with our 100,000th student campaign, which is coming to a close. As I’ve said before, the future is bright. I’m very pleased that Laura Walker, our Education Coordinator, will become Program Manager effective July 1, 2018. Laura has brought a high level of professionalism and great creativity for her work with the teachers who use the program, and in the development of our curriculum and the management of our website, among other duties. Sadly Adam Steckley, our Operations Coordinator, is moving back to Florida to take care of family matters, and although he is irreplaceable, his work will be taken over by Carl Keehn, Nikki Brooks and Patrice Riley. And, after nearly 20 years I will be retiring at the end of the year, and my replacement will be announced soon. As always, we appreciate your support, and encourage you to contribute to keep our program moving forward. O’Neill Sea Odyssey’s Celebration Party for its 100,000th student milestone will take place from 1-4 PM on Sunday, June 24 at Cowell Beach in Santa Cruz. The Dream Inn is the title sponsor and KSCO AM is media sponsor for the event, which will include the dedication of Jack O’Neill Way by Santa Cruz Mayor David Terrazas, hula dancing, face painting, sailing charters, and more. 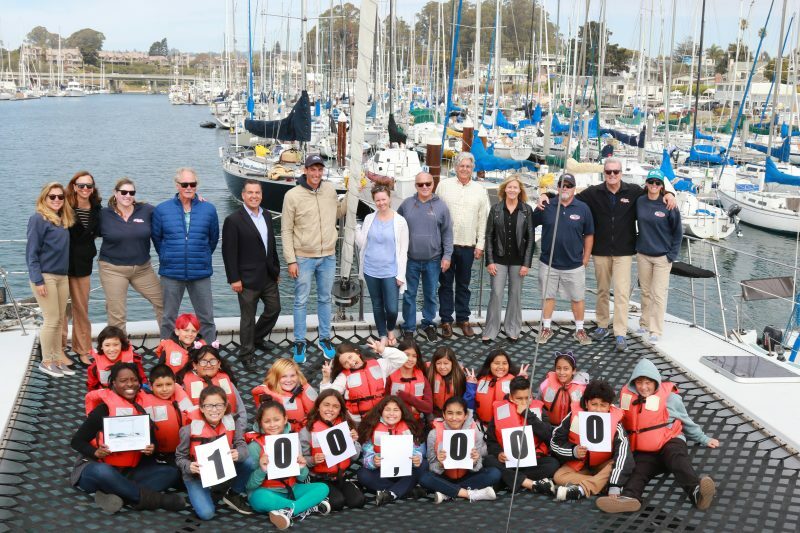 Over its 22-year history, O’Neill Sea Odyssey (OSO), a non-profit organization serving Central California 4th-6th grade students, will welcome its 100,000th student in September, 2018. For more information, go to www.oso100k.org, and on social media: Twitter @oneillseaodysse, Facebook and Instagram at O’Neill Sea Odyssey. 1:00-1:30 Check-in at registration table. Samba Stilt Circus dancers greet attendees. Guests gather in parking lot. 1:30-2:30 Dedication of Jack O’Neill Way. OSO milestone remarks. 2:30-4:00 Entertainment, food trucks, and beach activities. That’s right – you can win a 2 hour sail for 49 people on board the very same vessel that O’Neill Sea Odyssey uses for it’s ocean-going science field trip! How? You can purchase a raffle ticket – or more than one – to benefit OSO’s program as part of its 100,000th student campaign. While under state law we are not allowed to sell tickets online, you can learn more here. The winning ticket will be drawn at our 100,000th student milestone celebration on Sunday, June 24 from 1-4 PM at Cowell Beach in Santa Cruz. Meantime, we have served 97,719 students to date, thanks to your support! With a heart full of gratitude, I am writing to announce my retirement as Executive Director of O’Neill Sea Odyssey effective December 31, 2018, nearly 20 years after Jack O’Neill hired me to run the program. I’ve been contemplating this change for awhile, and now is the right time to turn leadership over to someone who can lead the organization into a very bright future. O’Neill Sea Odyssey has a top-notch Board of Directors, staff and volunteers, as well as generous donors who support Jack’s vision of getting young students onto Monterey Bay to learn science and to use that powerful knowledge to become ocean and watershed stewards. I’ve had what I think is the world’s most awesome job, with the best colleagues one could ever want. 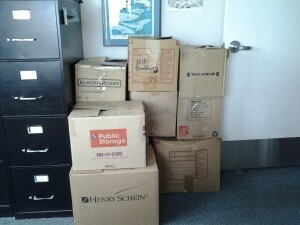 The executive director position has been posted at https://sfbay.craigslist.org/scz/npo/d/executive-director-oneill-sea/6589747360.html for the next 60 days. The goal is for the successful candidate to start October 1 and to work with our team for a smooth transition. While I look forward to taking time off, I will of course stay active in ocean protection. I want to thank you for your support of our program, our students and our ocean, and for all you do! On March 13, I had the honor of making a presentation at the 6th Annual International Marie Debris Conference, sponsored by the United Nations and the National Oceanic and Atmospheric Administration. My talk focused on O’Neill Sea Odyssey’s impact, especially on lower income youth. While many people intuitively view the work we do as having an impact, it is important to provide metrics to indicate that our work has value. In a nutshell, our impact can be measured in the short term, and in the longer term. For 2017, O’Neill Sea Odyssey posited the following outcomes: 1) 90% of students will have increased their awareness of and threats to watersheds and the ocean, 2) 90% of students are more likely to protect Monterey Bay and the ocean, and 3) 90% of students will advocate ocean and watershed stewardship. Those outcomes were measured using the student survey. The result was: Outcome 1 was 78% before program, 97.33% after, Outcome 2 was 69.5% before program, 94% after, and Outcome 3 was 70% before program, 94% after. When student survey results were divided by income level, they showed that all groups of students increased their environmental knowledge after attending the program. 69% of students from lower and 69% from middle income groups generally had very slightly lower overall levels of agreement before the program started than the 80% of higher income groups, but all income groups agreed at 94% or 95% by the end of the program. For the longer term, OSO instructor Lauren Hanneman authored a 2013 study for her master’s thesis at San Jose State University, which found 75% retention of non-point source pollution and marine debris concepts among students 5-7 years after they participated in program. She found a sample a 261 students from 4 high schools in OSO area. Her analysis factored out other programs and influences on the students, and based her work on the established idea that a single impression makes an impact for middle-grade students. You can read the study at http://scholarworks.sjsu.edu/etd_theses/4276/ . After a well deserved break, our staff instructors will be back at work teaching students at 8:30 AM on Tuesday, March 6. We are excited that we will serve our 100,000th student this summer, and that we have new, Next Generation Science Standards-aligned in-class curriculum for school classes that participate in our program. We have a bright future ahead, which means the students we serve will be even brighter. 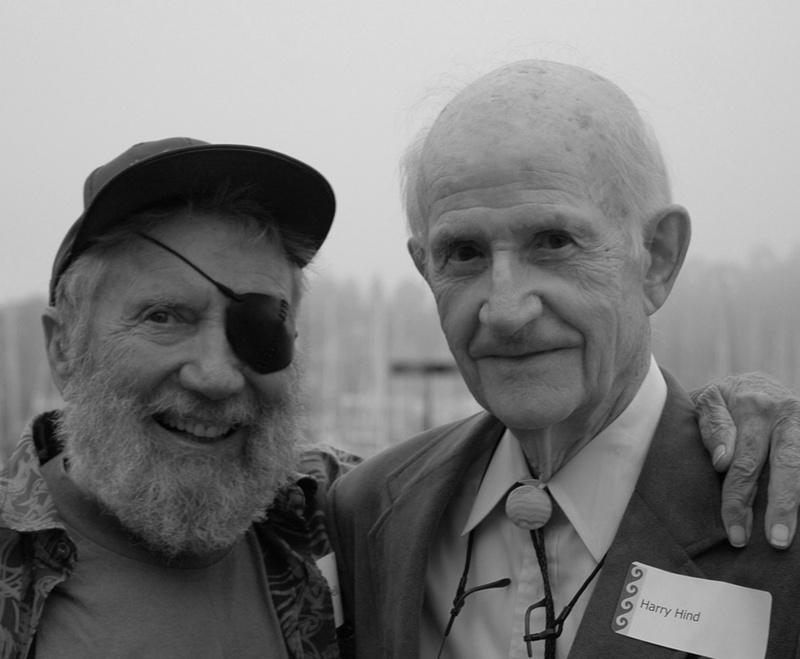 On June 2, O’Neill Sea Odyssey’s founder, Jack O’Neill, passed away peacefully at the age of 94. He was surrounded by his entire family at the home he loved on the cliffs of Pleasure Point in Santa Cruz. Over my more than 18 years with this organization, Jack spoke frequently about O’Neill Sea Odyssey’s future. In a video produced thanks to the support of Applied Materials in 2000, Jack said that he wanted the “get this set up so it will continue on and on”. That meant that we had to secure the funding, and the assets, so that O’Neill Sea Odyssey will continue into the future. And how is that being done? The Team O’Neill catamaran will continue to be a living classroom. O’Neill Sea Odyssey has also been working to secure additional years on the lease for our education center, the construction of which OSO donors generous supported, and which is due to expire in 2028. The support we receive from funding, thanks to you and our strong base of donors, will continue. Our supporters, including individuals, foundations, businesses, and some government funds focused on environmental protection, provide us with gifts, large and small. In O’Neill Sea Odyssey’s winter newsletter to be released in the coming weeks, you’ll read about the Jack O’Neill and Harry Hind Endowment Fund established by Leslie and Troy Daniels at the Community Foundation for Monterey County, and the O’Neill Sea Odyssey endowment at the Community Foundation – Santa Cruz County. These funds will produce revenue for our program in perpetuity. Jack O’Neill also left a fund for our future and O’Neill family members are also generously involved. Over the next several years we will be reaching out to our donors to consider supporting our endowment funds so that we can serve more students into the foreseeable future. You have already helped us come this far and for that, we thank you. Happy 2018! Applied Survey Research (ASR) has completed its evaluation of student survey results for O’Neill Sea Odyssey’s (OSO) program for the 2016-17 school year and found that the free, ocean-going science and ecology program had a high impact on participating youth. The study measured the results of surveys of students administered before and after the program as well as the results of surveys completed by teachers whose classes participated in the program, and cross-analyzed them against demographic data about the participating schools. Between July 2016 and June 2017, 5,281 students in 201 classes participated in the program, fewer than the previous year due to El Nino-driven harbor shoaling and dredging issues that kept the Team O’Neill catamaran from being able to leave the harbor. The Student Survey showed that the program was effective in promoting substantial increases in students’ environmental awareness. Before participating, an average of 70% of students agreed with the survey questions overall. After attending, this percentage increased to 94%. When student surveys were divided by income level, results showed that all groups of students increased their environmental knowledge after attending the program. When student surveys were divided by income level, results showed that all groups of students increased their environmental knowledge after attending the program. The students from lower (69%) and middle (69%) income groups generally had very slightly lower overall levels of agreement before the program started than the higher (80%) income groups but all income groups agreed at 94% or 95% by the end of the program. When teachers and group leaders were asked, 100% said that their students “learned a lot” from the program. Nine percent had attended the program previously. Based on population estimates, 66% of the students were Hispanic or Latino, 18% were White, 9% were Asian, Filipino, or Pacific Islander, 1% were African American, less than 1% were American Indian or Alaska Native, and 6% were of another race/ethnicity. 45% of the students attending the OSO program did not have English as their primary language. More than half (66%) of students were receiving free or reduced price meals. 55% of participating groups were lower income groups, 29% were middle income groups, and 15% were higher income groups. O’Neill Sea Odyssey and the Pepper College Readiness Network worked to upgrade and to provide our curriculum to schools nation-wide, and OSO continues to negotiate with the Santa Cruz Harbor to obtain an extension on its lease for the upstairs of the O’Neill Building which contains its education center, the Surfrider Foundation water quality testing laboratory, and private (revenue generating) spaces, which will expire in 2028. Renovation of this space was completed in 2005. Also that year, $57,578.45 was spent for bus scholarships for 111 classes. O’Neill Sea Odyssey’s 100,000th student will be served in 2018. 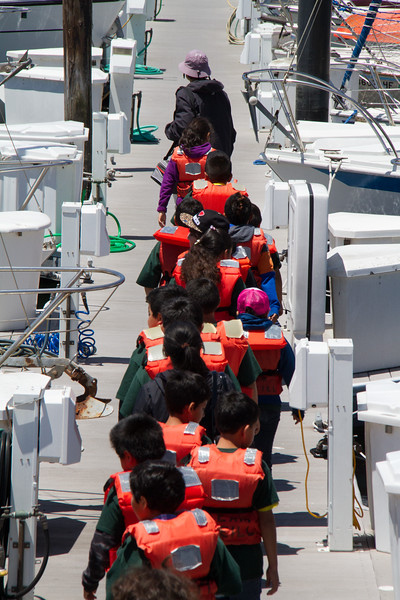 As of the beginning of this week, over 96,000 students have been served by our ocean science and environmental education program, which includes a sea-faring field trip, a community service project, and science curriculum for participating classrooms for 4th – 6th grade students. We anticipate serving 210-214 classes for the 2017-2018 school year with our free program, and we hope to serve our 100,000th student in July, 2018. 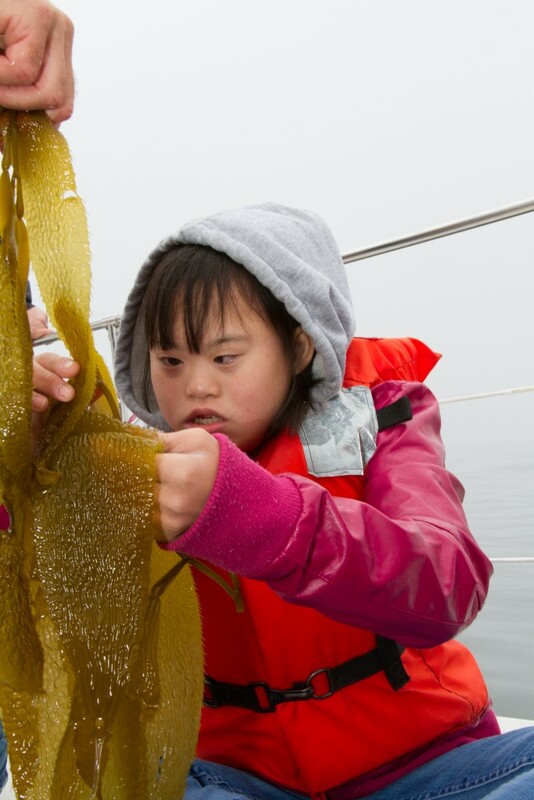 The field trip includes three onboard learning stations: navigation, including compasses and triangulation; marine ecology, including the kelp forest, marine mammals, and human impacts on Monterey Bay; and marine biology, specifically examining and learning about plankton. These stations are complemented by three stations at an education center on land: navigation, including reading and plotting navigational charts; marine ecology, covering the water cycle, watersheds, and ocean pollution from land-based activities; and marine biology, where the plankton samples collected on the boat are examined further using microscopes. O’Neill Sea Odyssey also raises funds to support bus transportation for school classes that cannot afford it on their own. Community Service Projects are conducted by each participating class. Some examples are: the incubation of steelhead eggs to be released into the San Lorenzo River, wetland cleanup and restoration with Watsonville Wetlands Watch, raising steelhead fry as part of the Children’s Vision for Coyote Valley (San Jose), Harkins Slough (Watsonville) restoration, sand dune restoration near Seaside, cleanup at the flood basin at the Palo Alto Baylands, participation in the annual Stanislaus River cleanup near Oakdale, raising steelhead trout for and cleanup of Los Alamitos and Guadalupe Creeks in San Jose, native plant restoration and repair of a rain catchment system at a Seaside park, forest cleanup at Fall Creek State Park in the San Lorenzo Valley; a project to monitor oxygen levels, temperature, turbidity and flow rate in Soquel Creek, cleanup of Upper Carr lake and Natividad Creek Park in Salinas, raising steelhead trout for release in the San Lorenzo River, participation in a 5 year study of Coyote Valley greenbelt’s native animals and plants in San Jose, Struve Slough native plant restoration in Watsonville, and the propagation of cuttings and replanting of native plants at Del Mar school in Santa Cruz. A 2013 study of the long-term impact of our program found that 75% of high school students who participated in OSO 5-7 years before retained knowledge of material taught in OSO’s ecology lessons, as they pertain to pollution that flows to the ocean from our watersheds. O’Neill Sea Odyssey’s outcomes are that 1) students will increase their awareness of and threats to watersheds and the ocean they flow to; 2) students are more likely to protect Monterey Bay and the ocean; and 3) students will advocate ocean and watershed stewardship to their families and friends. An annual analysis of our student survey results is conducted by Applied Survey Research and this past year, before participating, an average of 73% of students agreed with the survey questions overall. After attending, this percentage increased to 95%. When student surveys were divided by income level, results showed that all groups of students increased their environmental knowledge after attending the program. The students from lower and middle income groups generally had lower overall levels of agreement (73% and 71%, respectively) before the program started than the higher income groups (80%). All groups were at 95% after the program. When teachers and group leaders were asked, 100% said that their students “learned a lot” from the program. Your continued support makes this all possible. Thank you! In the 1950s, wetsuit innovator Jack O’Neill lived and worked in San Francisco, where he would often surf at Kelly Cove, at the north end of Ocean Beach. There, he met Harry Hind. They became life-long friends, surfing together and occasionally collaborating on various projects. 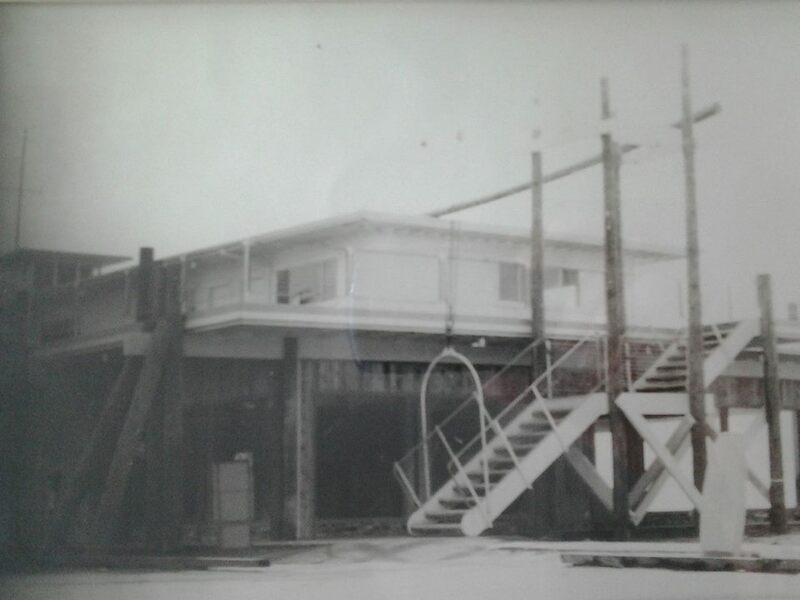 Harry financially backed Jack’s idea to build a surf shop at the Santa Cruz Harbor, which became a two-story, 8,500 square foot building, in 1965. O’Neill Sea Odyssey was responsible for renovation of the building’s upstairs in 2004-2005, while the Santa Cruz Harbor took the downstairs. O’Neill Sea Odyssey spent $1.5 million in mostly donor funds, making renovation financially feasible for the Santa Cruz Port District, and received a 25 year lease, which will expire at the end of 2028. O’Neill Sea Odyssey’s involvement in the building was possible thanks to the two remaining of the original four partners: Jack O’Neill and Harry Hind. Leslie Daniels is Harry’s daughter, and she and her husband, Troy, have made two generous gifts to establish the Jack O’Neill and Harry Hind Endowment Fund. Earnings from the fund will help to support OSO in perpetuity. The Daniels have generously supported OSO since Harry Hind passed away in 2012, in tribute to his life-long friendship with Jack, who passed away this year. 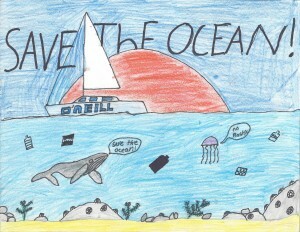 O’Neill Sea Odyssey’s work will continue on, but we need your help. Revenue from endowment gifts will support OSO’s work in perpetuity. 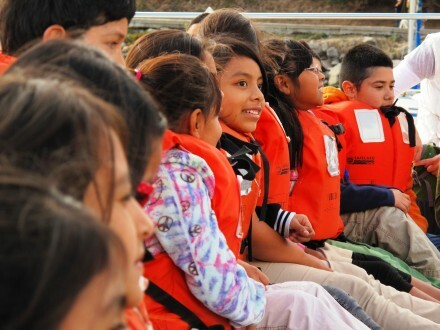 Gifts of cash, stock, or real estate can provide tax benefits to the donor while supporting OSO’s mission to provide a hands-on, ocean-going science and environmental education program to elementary school students, free of charge. Please contact me at dhaifley@oneillseaodyssey.org for more details. oso100k.org, oneillseaodyssey.org. O’Neill brand has made a $50,000 donation to O’Neill Sea Odyssey in memory of Jack O’Neill, who passed away on June 2 at the age of 94. Ronald de Waal, Chairman and shareholder of the O’Neill brand attended the paddle out in memory of Jack on July 9 and believes that Jack’s vision of promoting science and the ocean is of primary importance. 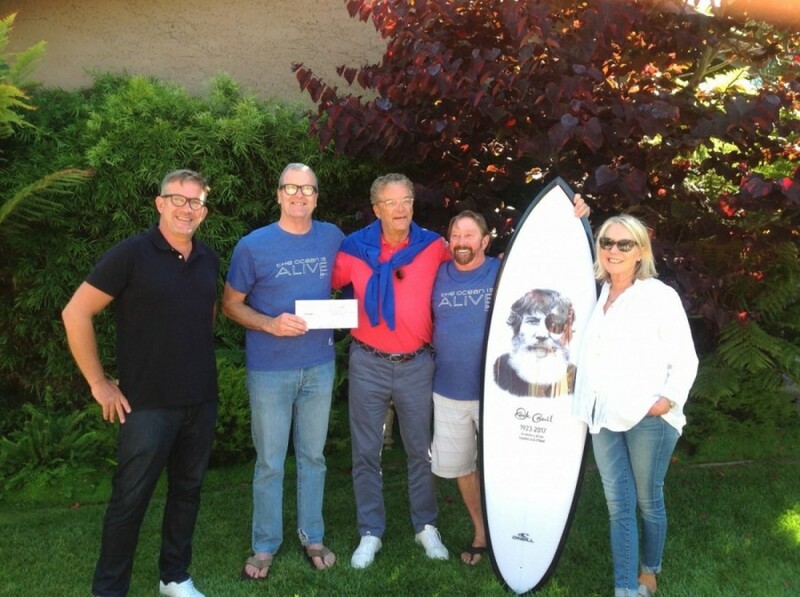 Mr. de Waal is pictured in the center of the photo, along with (left to right) O’Neill brand CEO Edwin Jonkers, OSO Executive Director Dan Haifley, O’Neill Wetsuits CEO Pat O’Neill, and OSO Board Chair Bridget O’Neill. “We are honored to receive this gift in tribute to Jack,” said O’Neill Sea Odyssey executive director Dan Haifley. “It’s very fitting given that Jack O’Neill saw the ocean both as a playground for sports, and a classroom whose science lessons would result in it’s protection.” O’Neill Sea Odyssey will serve it’s 100,000th student in July, 2018. In addition to the gift, O’Neill brand is donating proceeds from its Jack O’Neill Tribute T-Shirt, available at oneill.com, to the program. Learn more about O’Neill Sea Odyssey at oneillseaodyssey.org or oso100k.org. O’Neill Sea Odyssey will kick-off its fall season on Tuesday, September 12. We’re excited that Education Coordinator Laura Walker has scheduled over 100 classes for September, October and November, and if the weather cooperates and the dredge program keeps the harbor channel to Monterey Bay open, we will be able to serve our 100,000th student by the end of the 2017-2018 school year. Stay tuned! JOIN US FOR A RECEPTION FOR THE ADAM WEBSTER MEMORIAL FUND! – Tom Simpkins, Special Education Teacher, Scotts Valley, 2015. 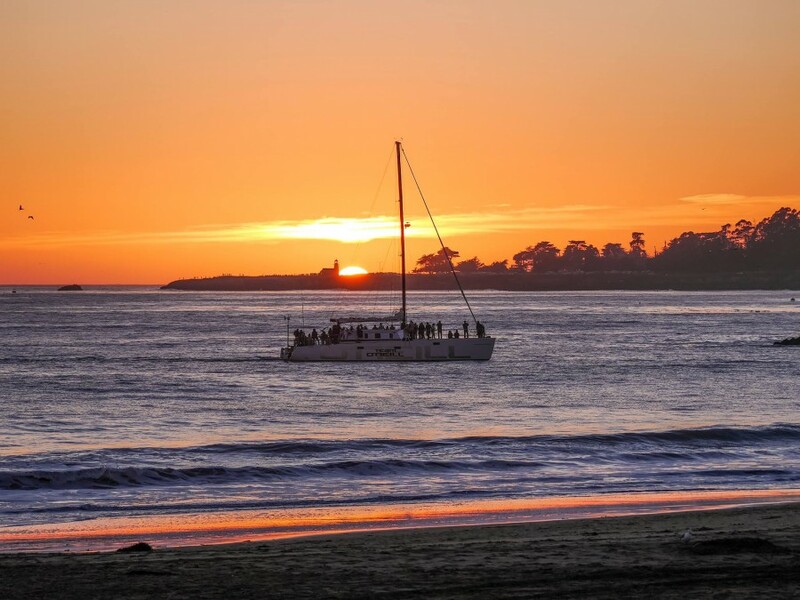 Join Tom and Judy Webster for complimentary wine and hors d’oevres, and an update on the success and future plans for the program from 5 PM to 7 PM, Thursday August 31, Santa Cruz Yacht Club. Admission is free. We need your support! RSVP by August 24 to Dan Haifley at dhaifley@oneillseaodyssey.org. 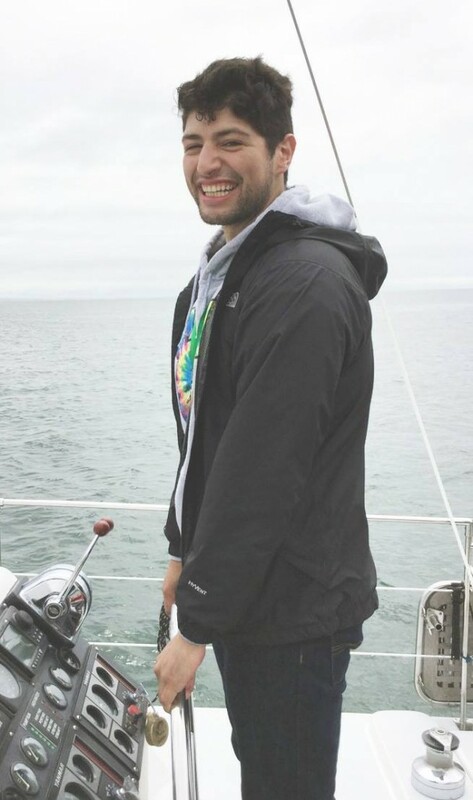 If you cannot join us, you can make a gift at oneillseaodyssey.org, click on Donate Online and scroll down to the Adam Webster Memorial Fund. Many thanks to System Studies Team Giving, Whole Foods, Trader Joe’s, Julie Pollack, and the Santa Cruz Warriors Front Desk Team for supporting this event! Education Coordinator Laura Walker reports that 201 classes were served for the year that ended on June 30, 2017. This is despite a record storm season that brought hundreds of thousands of tons of sand into the harbor and dredge equipment failures that made it more difficult for the Santa Cruz Harbor to keep its main channel out to Monterey Bay open for vessel traffic. We will have final student numbers later in the year, but rest assured we are well on our way towards achieving our goal of 100,000 students served by the end of 2018. Jack O’Neill’s legacy will live on through O’Neill Sea Odyssey. A heartfelt thank you to everyone who is planning to attend Jack O’Neill’s memorial paddle on Sunday July 9th. Ceremony starts from the water at 11:00 a.m. Please arrive by 10:00am to allow enough time to paddle out and join the circle. No public parking. East Cliff Drive will be closed from 30th Avenue to 38th Avenue from 7:00 a.m. to 4:00 p.m. Alternative parking on Portola Drive will be available from 36th Avenue past 41st Avenue. Permit parking fees will not be enforced the day of the paddle. Tents will be set up with coffee, water and snacks in the park South of Jack’s house adjacent to the bike path for paddlers. Paddlers are encouraged to enter and exit the water from the stairs North of Jack’s house at 36th Avenue. Please be aware, the tide is high mid day and could be challenging at all points of entry and exit. For those attending who do not plan on paddling, the view from the cliff will be spectacular. We expect the largest turnout for a memorial paddle out in the history of Santa Cruz. By the 50s Jack had both invented the first surfing and bodysurfing wetsuits and opened his first surf shop near Ocean Beach. He also coined “Surf Shop,” a term for which he later received a Registered US Trademark. At that time Jack famously remarked, “All my friends said, ‘O’Neill: you will sell to five friends on the beach and then you will be out of business’”. Inspired by the growing surf scene, Jack moved with his growing family 75 miles south to Santa Cruz, and opened his next surf shop there, where the Dream Inn stands today. Shortly thereafter he began making surfboards, promoting the first surf movies from Bruce Brown and producing wetsuits for the expanding population of surfers in Santa Cruz and throughout California. The surfing craze soon expanded way beyond California, and Jack rode that wave better and longer than almost anyone in the surf industry. Jack viewed what he did as a passion, and was more surprised than anyone that the business grew to the point that it did. 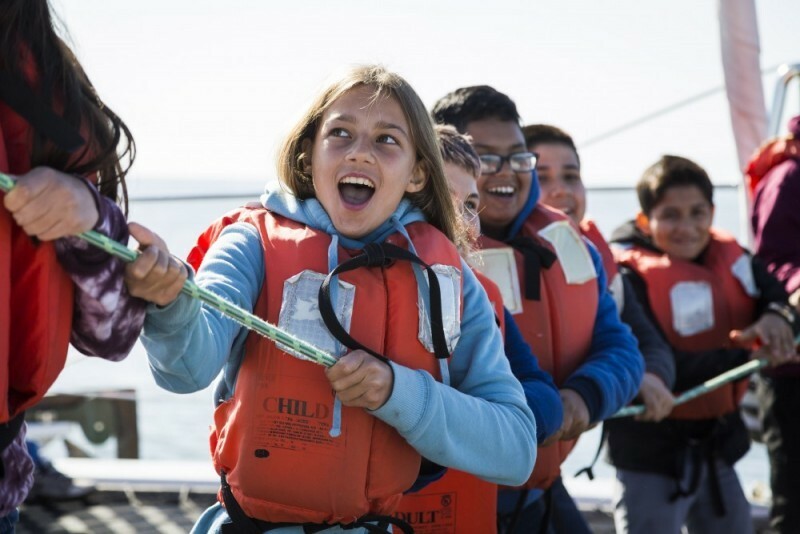 Over its 21-year history, O’Neill Sea Odyssey (OSO), a non-profit organization serving Central California 4th-6th grade students, has provided over 90,000 lasting marine science experiences. In its effort to help create the next generation of ocean stewards, OSO is working toward another milestone: in May or June of 2018, OSO will welcome its 100,000th student and today, May 1, begins a 14-month campaign in celebration of this achievement. 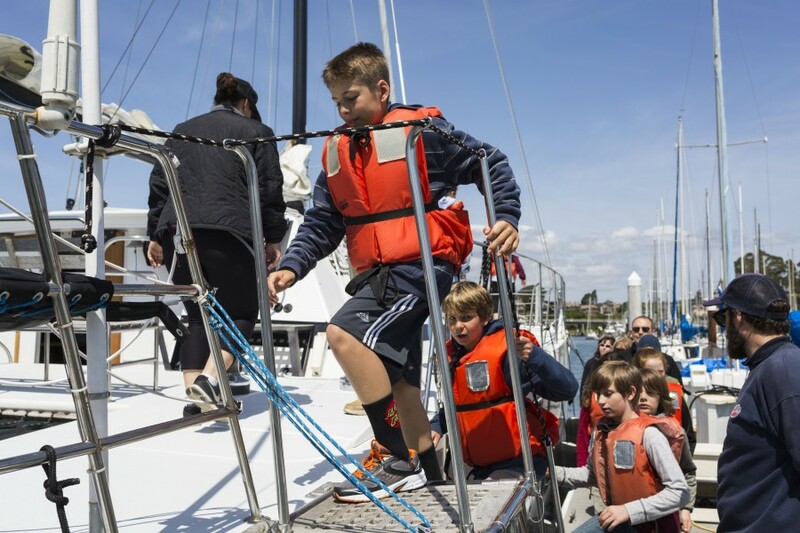 The program includes three learning stations aboard the Team O’Neill catamaran and follow up lessons in our shore-side education center. Students participate in navigation, marine biology and marine ecology lessons aligned with Common Core and Next Generation Science Standards. 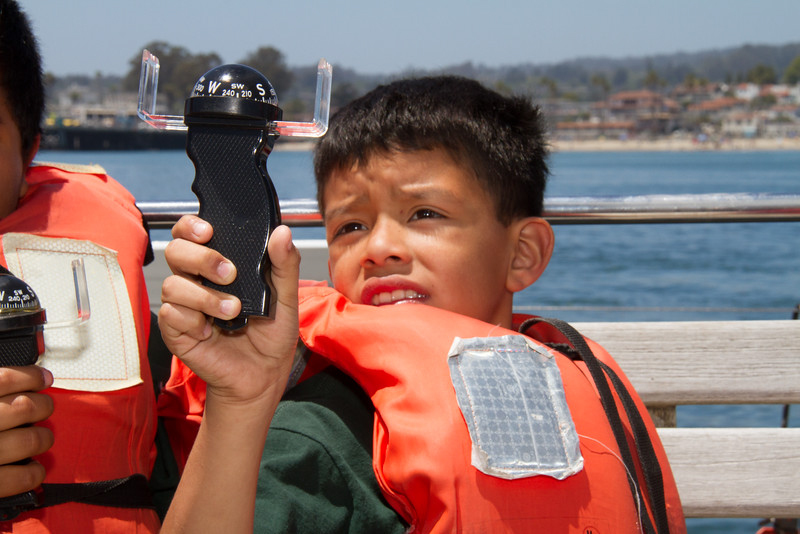 Students learn about navigational technology as well as old-fashioned, line of sight triangulation, they catch and identify their own plankton sample, and learn about the ecosystems in the Monterey Bay. 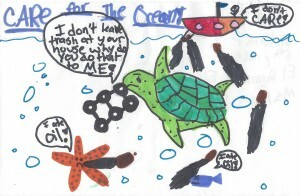 Students better understand their connection to the ocean environment and learn solutions to care for it through environmentally responsible behaviors. A 2013 study of the long-term impact of the program found that 75% of high school students who participated in OSO 5-7 years earlier, retained knowledge of material taught by OSO. Last year, 5,200 students from 202 classrooms participated in OSO programs with transportation underwritten for nearly 40%. 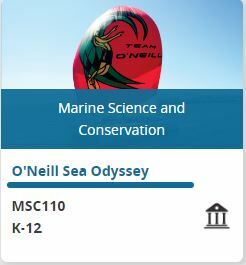 O’Neill Sea Odyssey has produced an online “virtual program” for classes that can’t get to OSO but can benefit from OSO lessons. O’Neill Sea Odyssey and the Pepper College Readiness Network have partnered to provide classroom curriculum to schools nation-wide. After serving their first student in 1996, whose class participated thanks to the vision of OSO founder Jack O’Neill’s belief that “The Ocean is alive, and we have to take care of it,” OSO continues to successfully educate youth over two decades later. 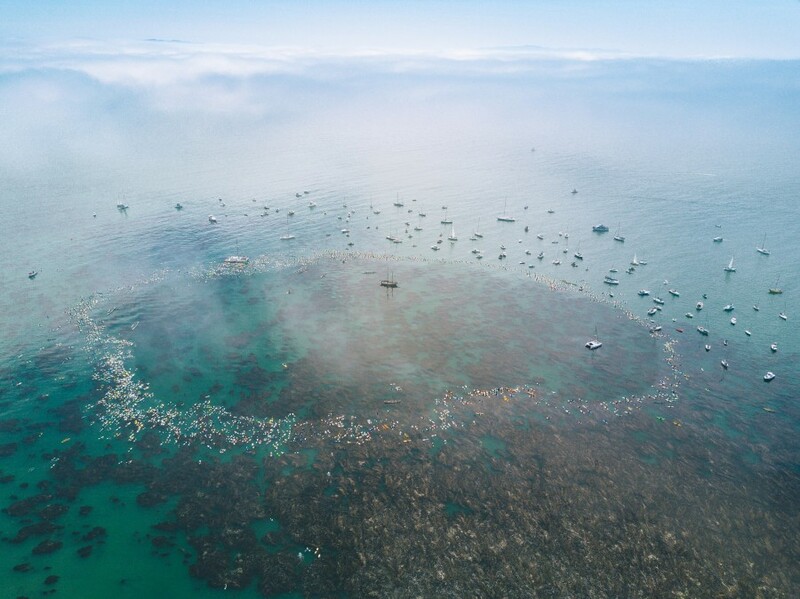 For more information, go to www.oso100k.org, and on social media: Twitter @oneillseaodysse, and Facebook and Instagram at O’Neill Sea Odyssey. 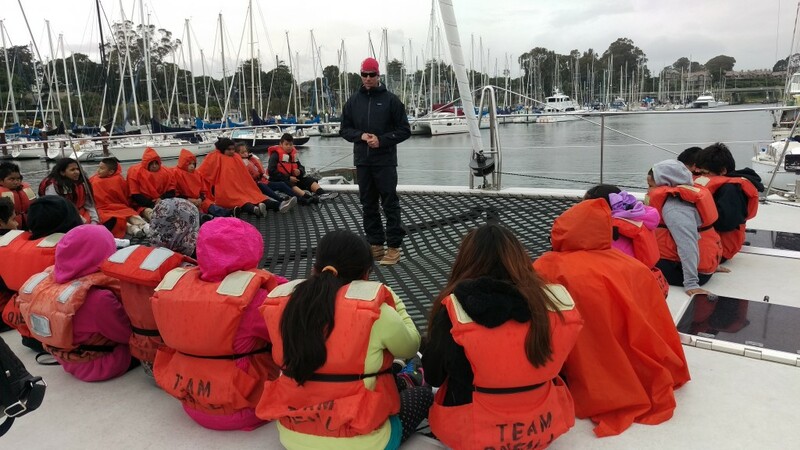 Andres Salgado, former OSO student returns 14 years later now as a 6th-grade teacher to bring his own class out to the catamaran! O’Neill Sea Odyssey intern Olivia Chun-Duncan asked Andres, why is this program so important? O’Neill Sea Odyssey’s instructors and skippers have settled into a busy spring season, serving school classes several days a week through the end of July. The daily routine involves a school bus arriving, students and teacher getting off then spending time at the beach, then meeting our instructors. 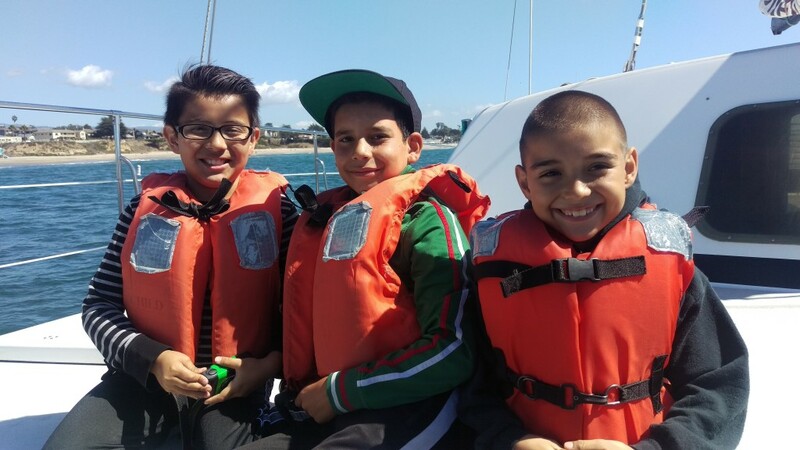 This is where the learning phase begins: the trip onto Monterey Bay aboard the Team O’Neill catamaran with a skipper and three instructors, then the return trip and the follow-up lessons in our education center at the Santa Cruz Harbor. The three learning stations are navigation (math), marine biology, and marine ecology. Each class completes a community service project for the free program, and each class gets free science curriculum for their classroom that integrates nicely with our field trip. 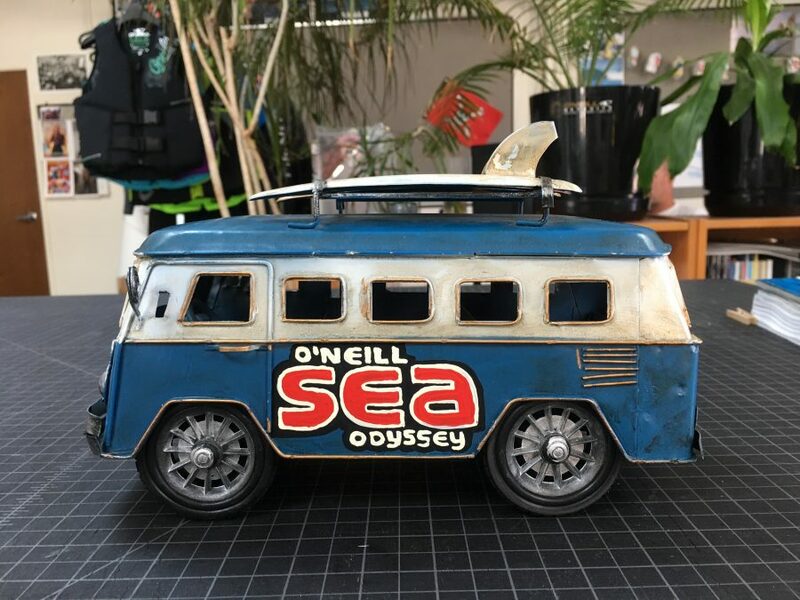 O’Neill Sea Odyssey also supports bus transportation. 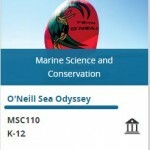 Many school classes use O’Neill Sea Odyssey as a central component of their science lesson plans. This would not be possible without your support. You can make an online contribution today to help us continue our work. Thank you! Spring is here and classes are starting to board the catamaran again. While these classes are starting to board again, the classes at the university are wrapping up. After a hiatus, boarding the catamaran again was a chance for me to take a break from exams and focus on something else that I love, which is youth education. However, I couldn’t help but weave all that I’ve learned from my courses this quarter to everything that the crew at OSO is teaching on the boat. The students cycle through three sections on the boat in which they learn about marine biology, marine ecology, and navigation. I happened to take a marine ecology and invertebrate zoology course this quarter and there were plenty of facts and processes that I’ve learned that I wanted to share with the students. However to my surprise, today’s students already had a great amount of knowledge about species interactions, keystone predators, and the body plan of plankton and other organisms. A group of students perfectly, and effortlessly, described the interactions between kelp, sea urchins, and sea otters and their impact on the kelp forest. I was amazed by the fact that these students are able to apply their knowledge outdoors and truly gain a hands-on experience with OSO. 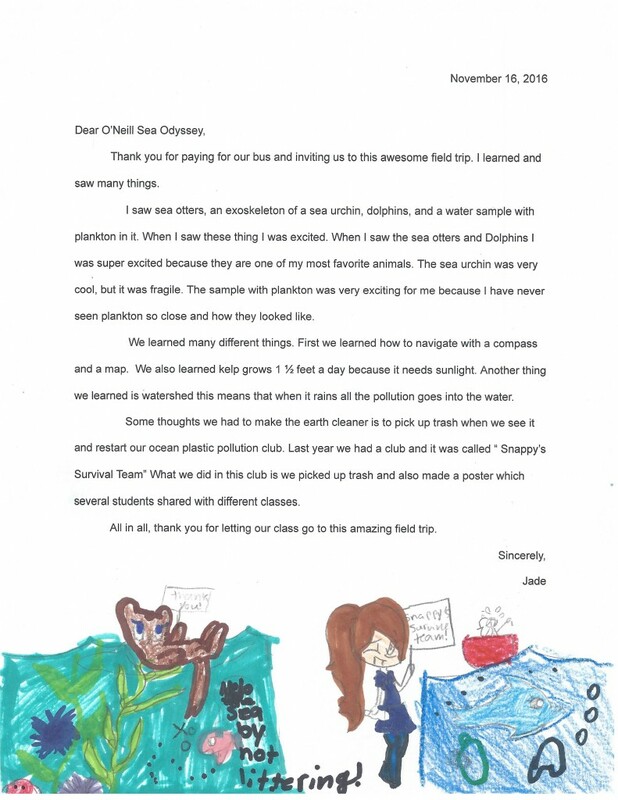 I believe that these students will one day go onto a university to expand their knowledge of the ocean and its inhabitants and will look back to the day that they boarded the catamaran with OSO. The experience that this program offers our youth is beyond what words can describe. It is truly an experience of a lifetime and will, in fact, raise awareness within our youth to help keep the ocean alive. Thank you, Santa Cruz Harbor! 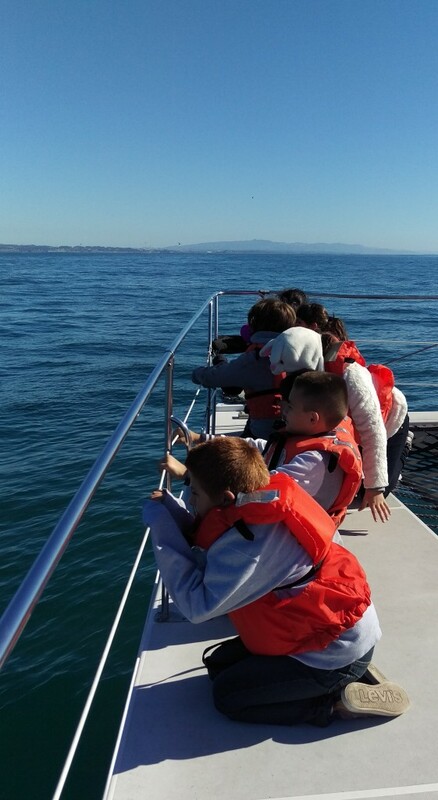 Today we were able to get out of the Santa Cruz Harbor and onto Monterey Bay to conduct our ocean-going science classes. Contending with thousands of tons of sand that were washed into the harbor channel by months of storms, as well as the loss of both engines on the Santa Cruz Harbor’s dredge tender Dauntless, many individuals working for the harbor organization undertook extraordinary efforts to make our work possible. Thank you! California Coastal Commission’s “Protect Our Coast and Ocean” grants program in support of coastal access, habitat restoration and education, or both. If you owe money, you can add your donation to the taxes. If you expect money back, you can deduct how much you want to give from your refund. Money will be distributed as grants to clean up shorelines, restore habitat, teach marine science and stewardship, bring underserved youth to the coast and ocean, and promote coastal access. Projects that receive funding will be selected by the California Coastal Commission as part of the competitive process for the Whale Tail Grants Program, which previously was solely funded by sales and renewals of California’s Whale Tail License Plates. For the sake of full disclosure, O’Neill Sea Odyssey has received Whale Tail grant funds. In 2016, the tax check-off brought in $321,130 for the Whale Tail grants program. This was in addition to the $5.5 million the Whale Tail License Plate generated for the Coastal Commission public education efforts, the Commission’s Whale Tail Grants Program, the California Coastal Conservancy, and a variety of state environmental programs of the California Natural Resources Agency. California sea otters play a key role in maintaining healthy kelp forests near shore. Legislation to authorize the tax check-off was authored by then Assemblymembers John Laird and Dave Jones in 2006, and efforts to keep it in place were led by now-Senator Bill Monning along with Assemblymember Mark Stone and then-Assemblymember Luis Alejo. Prized target of fur hunters in the 1700s and by the early 1900s their California sub-species was thought to be extinct, but a small group was discovered near Bixby Creek in Big Sur in 1938. Friends of the Sea Otter was formed in 1968, and they worked with others to obtain state and federal protection for the species. The population is now estimated to be 3,272 – based on an average of population counts over three years – from San Mateo to Santa Barbara counties. Sea otters deaths have been from natural causes and shark attacks and some preventable causes, such as toxins from inland lakes. 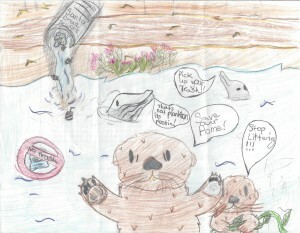 For information, visit http://www.seaotters.org/checkoff/ . At tax time, please remember to give! On Tuesday, March 7 at 8:30 AM, a fifth grade class from Santa Cruz Gardens School will kick off our spring season for O’Neill Sea Odyssey. We’re keeping our eye on the progress of the Santa Cruz Harbor’s new dredge, The Twin Lakes, and the progress it makes in opening up the harbor mouth. In the meantime, we look forward to a great season, lots of hands-on science, and many sea-inspired stories! Since 2010, O’Neill Sea Odyssey (OSO) has been recognized as a certified green business in the Monterey Bay Area Green Business Program. During that time, our compliance with all regulations and program standards has been on-going but the certification term expires every three years. OSO is happy to announce that we have been re-certified for a third term. As a non-profit organization with the mission to provide a hands-on educational program to encourage the preservation of our living sea and communities, O’Neill Sea Odyssey is committed to promoting environmental education, outreach and awareness to the greater community. OSO also incorporates sustainability practices into core operations and strives to conserve resources, prevent pollution and minimize waste. Leading by example, our staff, volunteers and partners encourage environmental stewardship through the course of our work. If you, too, want to become green certified or learn more about getting recognized for being green, just link to Monterey Bay Green Business. Our blue planet thanks you. 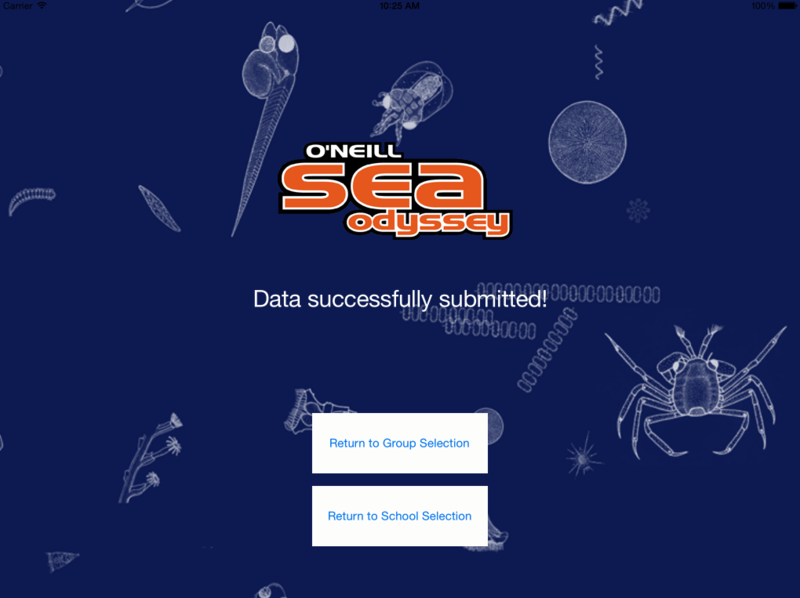 Last year O’Neill Sea Odyssey partnered with Public Consulting Group (PCG) to develop an online version of the OSO curriculum to provide our teachers with a free professional development tool. Education Coordinator Laura Walker, worked with PGC staff to rewrite the OSO curriculum so that it could be offered through PCG’s online Pepper Professional Development website. This accredited course, O’Neill Sea Odyssey: Marine Science and Conservation, can be used by OSO teachers to get their required professional development credits through OSO’s marine science curriculum. The online course includes a detailed matrix of Next Generation Science Standards (NGSS) and Common Core practices that are used in our curriculum. 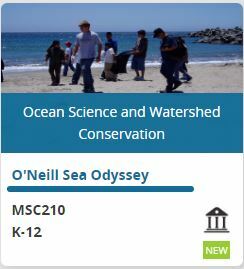 We also created a second curriculum course, O’Neill Sea Odyssey: Ocean Science and Watershed Conservation, specially designed to be nationally applicable for teachers and school districts. The second course is a watershed-to-the-sea curriculum that can be used anywhere in the US, even if there is no access to the ocean. This curriculum focuses on watershed ecology, including freshwater plankton studies and ocean conservation through watershed stewardship. The course is also aligned with NGSS and Common Core and will allow teachers to update their teaching to the new standards. 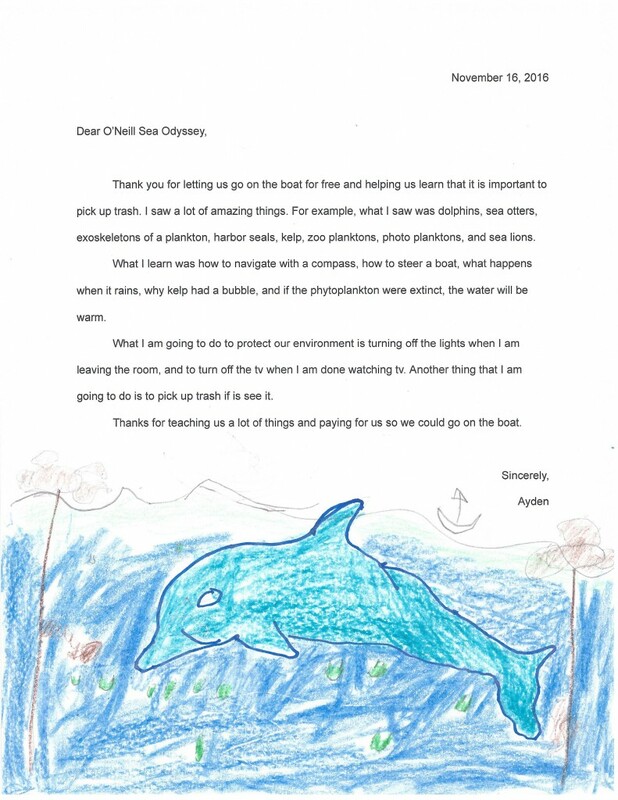 These Castroville students wrote to O’Neill Sea Odyssey in November, 2016. Bus transportation funds have been generously provided by a number of sources, including a major anonymous donor, the California Coastal Commission, the Monterey County Fish and Game Advisory Commission, Omega Nu, the Santa Cruz County Fish and Game Commission, the California Coastal Conservancy, and a variety of individual donors. – Students of Castroville Elementary School who attended OSO 11/15/2016. Posted 1/23/2017. O’Neill Sea Odyssey is free of charge to participating schools, but each class performs a community service project. This accomplishes two things: 1) the students learn the value of what they are receiving but more importantly, 2) they engage in their neighborhood and community, giving back, being part of something greater than themselves. the propagation of cuttings and native planting by Del Mar school in Santa Cruz. 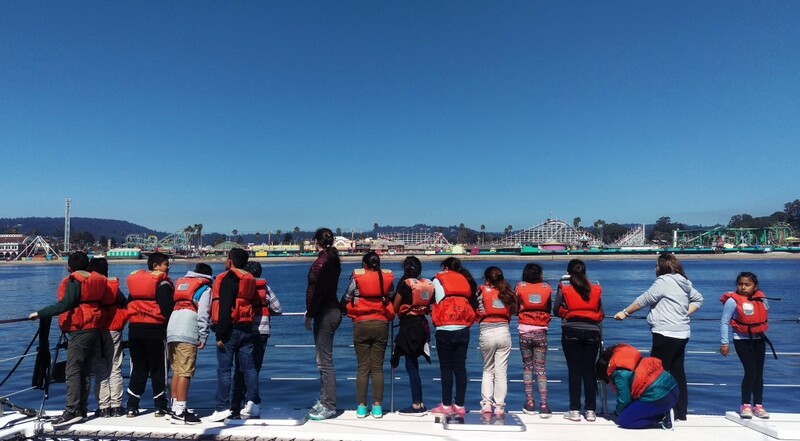 Recently O’Neill Sea Odyssey received communications from Ana Thomas, a teacher at Peralta School in Oakland, as well as Edgar Landeros, who is the Program Coordinator at Nueva Vista Center, for underserved Latino families in Santa Cruz. Edgar participated in youth programs as a child, and his experiences with O’Neill Sea Odyssey have remained with him. These comments not only speak to the work we do, but to the need for hands-on, ocean science generally. I am a teacher in the Oakland Unified School District in California. My students have participated in the Oneill Sea Odyssey at least five times in years past. I am writing a letter of support for this program because I really believe this type of field study is urgently needed in our schools. As an elementary teacher, I love this program for a variety of reasons. One, the children get hands-on lessons about current marine science in a very dynamic way. Every year, my students’ eyes lit up as they boarded the large catamaran for classes. My kids raved about the experience for months afterward and were motivated to produce reports and academic videos for our greater school community. Second, the hands on plankton sampling experiment is very meaningful for my students; not only do the children marvel at the amount of organisms found in a drop of ocean water, but they also gain valuable classification strategies. They learn the differences between phytoplankton and zooplankton while actually looking at living samples with magnification tools. Further, this “nose to nose”* interaction is crucial; I have found that it engages more students to learn and do follow up research. Third, the watershed model where students reenact what happens with marine debris and pollutants when it rains is ingenious. 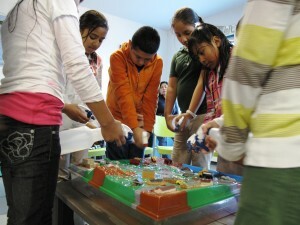 The kids hold spray bottles and squirt a watershed model that is sprinkled with pollutants. The “rain water” pushes the toxins down to sea level. The toxins are represented by different colored cake sprinkles, but the children really get the idea. They see how oil spills, pesticides, litter, cow manure, and factory wastes end up in the ocean using the watershed model. My students have been very motivated after this lesson; we authored numerous videos for our community about marine debris. Several students even started a student centered litter pick up movement at our school! There is another point that I think is very significant. These trips create equity within the student group. Every child has the same experience and can draw from it. Everyone gains valuable insights and connects with the materials. I have seen children with very little ability to speak English engage fully and do strong follow up report writing. I have also seen children who normally do not engage in lessons come to life and become active participants. The Common Core Standards are all about having children write from real life experiences and this program is well suited for follow up writing tasks. The Next Generation Science Standards are all about children thinking about problems and coming up with solutions. My students study marine debris clean up prevention strategies and inventions. In addition, they always generated good ideas themselves. 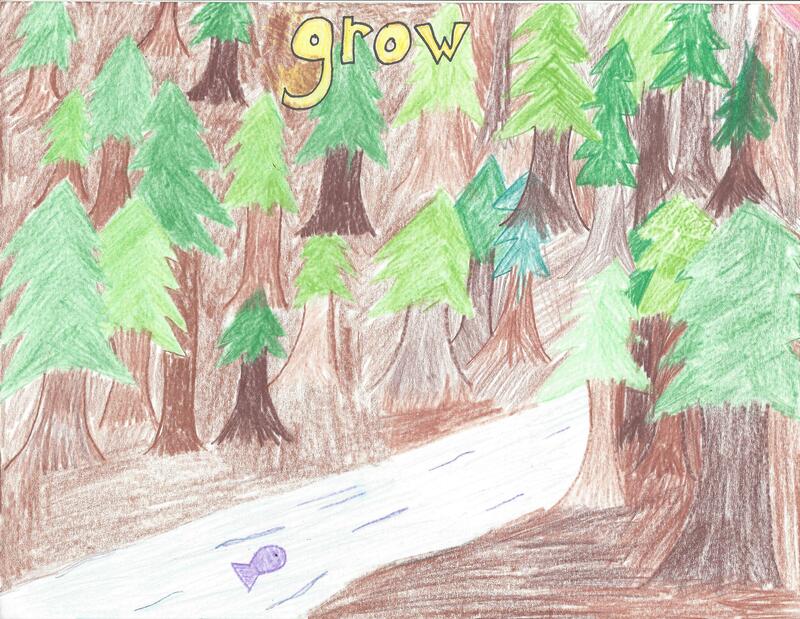 This program makes children become stewards of marine environments and watersheds! Last, I just want to add that children need to learn with wind in their hair. We need to get them outside doing real field study. 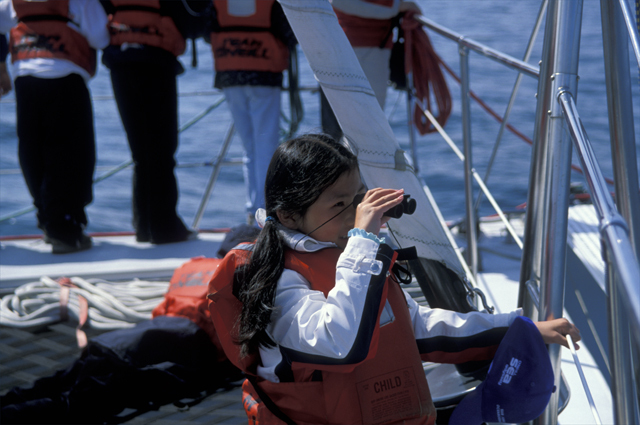 More children need exposure to marine science jobs and participatory research. * Nose to nose interactions happen when the child in near the real life organism that is being studied. My name is Edgar O. Landeros and I am currently the Program Manager for Nueva Vista Community Resources, a program of Community Bridges. I have been a part of Nueva Vista, since I was 10 years old, when it was an independent family resource center by the name of Familia Center. I originally started off as a participant in their after school homework club as well as in their Summer Fun! recreational camp. Afterwards, I took on the position of Pantry Coordinator while attending college. It wasn’t until recently that I was promoted to my current position. Even though I wasn’t born in Santa Cruz, I have resided here for the past 27 years. Growing up I attended all of the local schools: Branciforte Elementary, Branciforte Jr. High, and Harbor High. After high school I attended Cabrillo College, and later transferred out to California State University Monterey Bay, CSUMB. I graduated from CSUMB in the spring of 2011 with a degree in Business Administration with a concentration in Entrepreneurship. Growing up, one of the programs that had the greatest impact in my life was the O’Neill Sea Odyssey Program. It was through this partnership, between Nueva Vista and O’Neill Sea Odyssey that I got to learn about marine ecology and conservation. Also, through this wonderful program I got to understand that the actions that we make everyday on land affect our local beaches at one point or another. 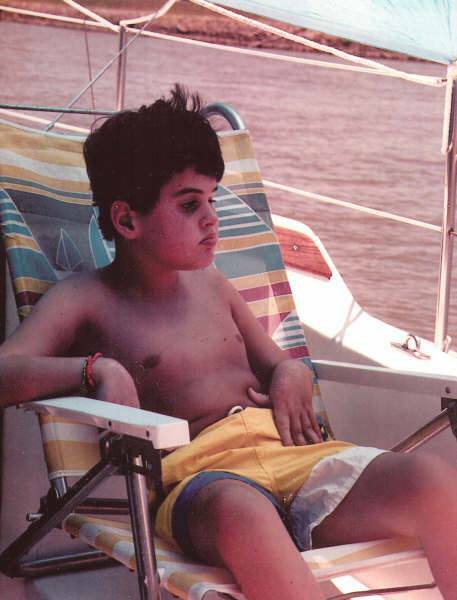 It was also through this program that I got to experience my first outing on a Catamaran. Nueva Vista through this partnership has continued to provide this wonderful and fond experience to the underprivileged children that we served in our community, who live in the Lower Ocean Street and Beach Flats Neighborhoods. These neighborhoods are Federally designated as low-income neighborhoods where the poverty level is high, and majority of the families are immigrants. Nueva Vista seeks to continue enhancing the environmental experience for its youth participants that participate in its Ocean Scholars and Summer Fun! Programs. We are proud to partner with O’Neill Sea Odyssey Program to provide these opportunities for Elementary and Middle School students. I offer the Nueva Vista Community Resource’s support and commitment to continue partnering with O’Neill Sea Odyssey to deliver this wonderful experience, and to ultimately benefit the youth in the Lower Ocean Street and Beach Flats neighborhoods. So what’s the big deal about a high tide? Well, King Tides have evoked a lot of interest lately as the high water mark, literally, of the year that can predict what a coastal area can look like with predicted sea level rise. So, for instance, Elkhorn Slough can mark the occasion by noting what portion of the wetlands habitats are under water, which can help researchers calculate how those habitats will change with rising waters. Every riparian habitat, every road, every grassy area, every rock out-cropping can be affected differently. When I served as Chair of the Santa Cruz County Commission on the Environment we were fortunate to have the Planning Department work up a climate action strategy, with an emphasis on adaptation. If sea level rise is inevitable, then we figured we had better figure out the impacts on public infrastructure, private property and critical habitat before it starts to happen. O’Neill Sea Odyssey treats the ocean and the watersheds that drain to them as a science lab that teaches us about the world we live in. The King Tides events of January 10, 11 and 12, 2017 provide another great opportunity to learn, and to adapt. Learn more at http://california.kingtides.net/ . Here are some King Tide photos from around California. 2017 is here and our staff is busily scheduling classes to begin in March. We will have to make up some lost time since rough ocean conditions and a few other factors meant fewer classes last fall, but we are on track, so far, to serve 205 in the 2016-17 school year. 2016 was a busy year. Of course, we celebrated our 20th Anniversary in grand style. We also trained new instructors who are doing a wonderful job. We had a very successful Faces of the Sea Odyssey photo exhibit last February, and we made changes to how our weather station’s data is displayed on our website (you can find it on the home page under “current conditions”). We continued negotiating with the Santa Cruz Port District in an effort to extend our building lease, scheduled to expire in 2018, and we began to work with Compass Rose on website maintenance. Thanks to the hard work of Education Coordinator Laura Walker, working with the Pepper College Readiness Network, this month we will launch some new classroom, ocean-based curriculum on Pepper’s national web-based platform. Our science curriculum and associated products are aligned with Common Core and Next Generation Science Standards given the integration of subjects that takes place when dealing with dynamic systems such as watersheds, weather systems, and the ocean. We continue to raise funds for bus transportation, having provided bus scholarships for 78 classes in 2015-16 and, most importantly, we will be raising funds for our free, ocean-going field trip. Thank you for your support, and we hope to see you in 2017! Thank you for all your support in 2016…see you soon! On our last day of class for 2016, education coordinator and instructor Laura Barnes taught navigation to students from Baymonte Christian School in Scotts Valley while operations coordinator Adam Steckley caught some of it on video. It’s a great, practical lesson in applied math. To watch, go to the O’Neill Sea Odyssey Facebook page and, please, remember to “Like” us. Enjoy! 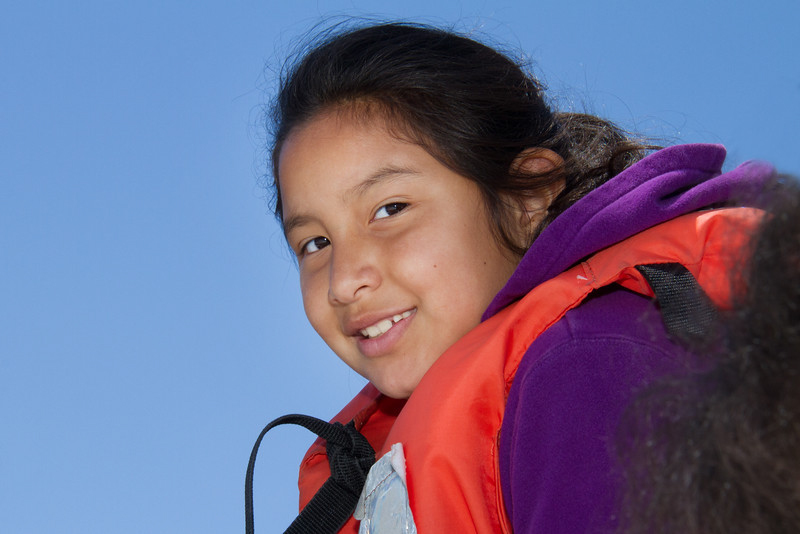 95% of students of all income levels retain lessons on ocean science and stewardship. Applied Survey Research (ASR) has completed its evaluation of student survey results for O’Neill Sea Odyssey’s (OSO) program for the 2015-16 school year and found that the free, ocean-going science and ecology program had a high impact on participating youth. 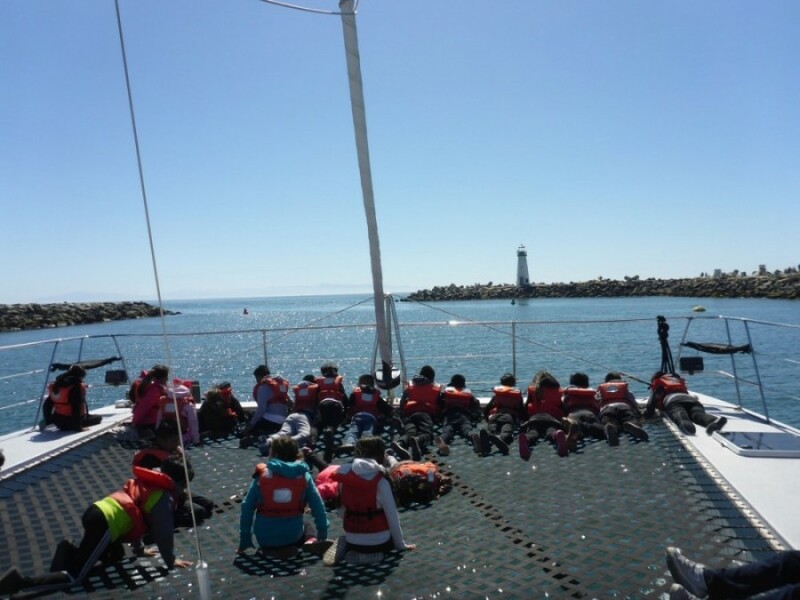 OSO engages 4th – 6th grade youth with a hands-on science education field trip on a 65-foot catamaran on Monterey Bay and in a shore-side education center, in addition to ocean science curriculum provided for use in the classroom. It is free, and each class completes a community service project. OSO also funds bus transportation to and from our site for lower income schools. The study measured the results of surveys of students administered before and after the program as well as the results of surveys completed by teachers whose classes participated in the program, and cross-analyzed them against demographic data about the participating schools. “We are pleased that the ASR analysis indicates that our instructors continue to be effective at teaching ocean concepts across several subjects including math and science while inspiring environmental stewardship and advocacy”, said OSO Executive Director Dan Haifley. Between July 2015 and June 2016, 5,281 students in 202 classes participated in the program, fewer than the previous year due to El Nino-driven harbor shoaling that kept the Team O’Neill catamaran from being able to leave the harbor. The Student Survey showed that the program was effective in promoting substantial increases in students’ environmental awareness. Before participating, an average of 73% of students agreed with the survey questions overall. After attending, this percentage increased to 95%. When student surveys were divided by income level, results showed that all groups of students increased their environmental knowledge after attending the program. The students from lower and middle income groups generally had lower overall levels of agreement (73% and 71%, respectively) before the program started than the higher income groups (80%). All groups were at 95% after the program. When teachers and group leaders were asked, 100% said that their students “learned a lot” from the program. Seven percent had attended the program previously. Based on population estimates, 64% of the students were Hispanic or Latino, 19% were White, 9% were Asian, Filipino, or Pacific Islander, 1% were African American, less than 1% were American Indian or Alaska Native, and 7% were of another race or ethnicity. 46% of the students attending the OSO program did not have English as their primary language, a slight increase since 2010-11. More than half (66%) of students were receiving free or reduced price meals. 55% of participating groups were lower income groups, 29% were middle income groups, and 15% were higher income groups. 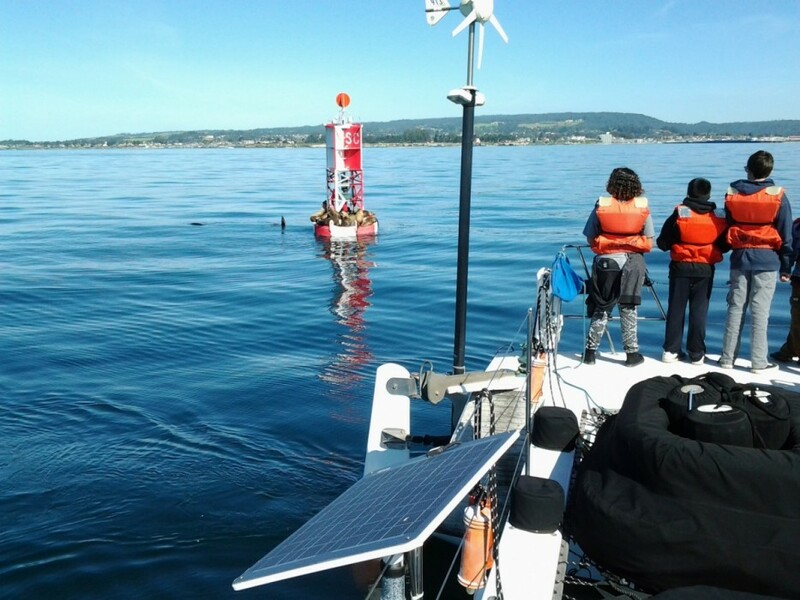 In 2014-2015, OSO developed a “virtual program” now available online fort students who physically cannot get to OSO’s facility, and also developed a new app that allows oceanographic data from the boat to be entered by students directly onto OSO’s website for their use in their own classrooms. 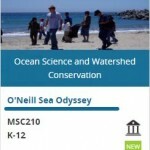 O’Neill Sea Odyssey, working with the Pepper College Readiness Network, this month launch its classroom, ocean-based curriculum on Pepper’s national web-based platform. O’Neill Sea Odyssey continues to raise funds for bus transportation, having provided bus scholarships for 78 classes in 2015-16. Today’s students were from Live Oak Elementary and they were livelier than ever! These students brought plenty of excitement with them out onto the boat. They were full of energy as they gathered onto the net of the catamaran but once they found out there were whales nearby they settled down to view the natural wonders of the ocean. Luckily, they were able to see several spouts! They even saw a couple of whales surface! They remained cool and collected the entire time, making sure not to frighten the whales. However, once the boat docked back into the harbor, this class was encouraged to recollect all their energy and sing! All the kids were lined up ready to go back into the OSO building when they started to sing “Happy Birthday” to one of OSO’s instructors, Adam Steckley. The class sang their hearts out and gave a very warm birthday surprise to Adam. This was certainly a day like no other aboard the catamaran! What a day! 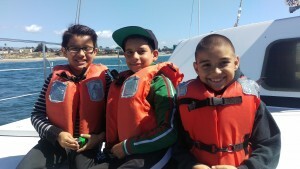 The 4th graders from Santa Lucia, located in King City, got an experience of a lifetime today on the OSO catamaran. The temperature was mild, the sky was clear, and everyone was out…including some friendly inhabitants of the Monterey Bay. The first sighting of the day was not an animal but was, in fact, some familiar faces. These familiar faces happened to be friends of the OSO crew and were traveling in their boat, ironically named, Lucia. They weren’t just enjoying a day out in the water but they were actually headed to the Caribbean! The students were able to wave goodbye to the friends as the catamaran passed along the water. The second sighting of the day was the most exciting. They got to see a Humpback whale! Initially only seeing spouts, the children were on the lookout to see a fluke or a fin. Eventually as time carried on the students were able to see both. The students were clearly excited as they pointed and shouted at the whale diving into the water. The last two sightings of the day happened to be of the same animal, a sea otter. For each field trip there is normally a sighting of several sea otters in the kelp bed, however, this time there were two sea otters that got up close and personal. The sea otters were only a few feet away from the boat and remained above water the entire time the boat was near. There was one sea otter in particular that kept rolling in the water, suggesting that it was cleaning its fur, perhaps after a foraging dive. The students all gathered to one side of the boat to observe the amazing wonders of ocean life. According to two students they had “never been on a boat before”. If there were to be a particular day to be aboard the OSO catamaran, today was definitely the day. O’Neill Sea Odyssey would like to invite you to our Fifth Annual Holiday Lighthouse Lighting Ceremony and Celebration, held on Thurs., Dec.1, 2016. This event will be held at the Crow’s Nest Harbor Room from 5:30-7pm. The cost is $50.00 per person and space is limited! All proceeds will benefit OSO. Food and wine will also be served. To learn more details please click on the link below! This must be a déjà vu! It certainly is for mom Josefina Flores. 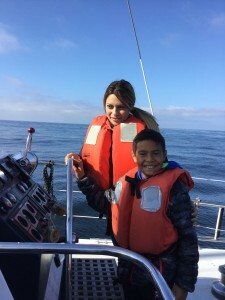 On September 30, 2017, Josefina joined her son Joel Ruiz on a trip aboard the OSO catamaran. However, this wasn’t her first time being on the boat. About 18 years ago Josefina was a student herself participating in the program with her teacher Alice Miller, whom is currently her son’s teacher as well. They are from Hall District School in North Monterey County and it is rather exciting to know that this school has had the opportunity to join in on OSO’s program throughout the years. It’s nice to keep a tradition alive! Hooray for Rotary! Just this past week Rotary Club of Santa Cruz President Sid Slatter and fellow Rotarian Larry Wallerstein decided to pay a visit to OSO. They spent the day on the catamaran and participated in the day’s activities with the rest of the students that were aboard that day. 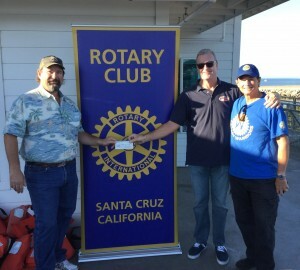 In addition to experiencing the program first hand, the Rotary Club of Santa Cruz decided to show their support for OSO by donating a check! They even brought their banner to pose in front of when giving the check to Executive Director Dan Haifley. The money donated by Rotary will benefit students that participate in the program. It will essentially go towards maintaining the catamaran, the instructors,and supplies. We are very grateful for the donation provided and look forward to having a great year with our supporters! Goodbye summer, hello fall. With school back in session, classes have been boarding the catamaran once again. This time it was Radcliff Elementary School from Watsonville. This class of fifth graders came in with plenty of excitement as they arrived at the OSO building. After they patiently awaited instructions and guidelines, they strapped on their life preservers and they were ready! As normal protocol the students were separated into 3 groups and they chose their group names, which happened to be the harbor seals, California sea lions, and elephant seals. Then they were off! As the students boarded the boat their excitement grew to curiosity as they all nestled onto the net looking at the waves ahead. However, their curiosity must have been on the physical beauty of the ocean because these students came with plenty of knowledge on the dynamics of the ocean. These students quickly answered questions about the role of plankton and kelp forests in the ocean. They even compared the role of micro-habitats to the movie Finding Nemo. 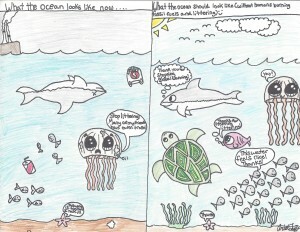 The students were also very aware of the dangerous effects of pollution to ocean animals. One student even brought up the unfortunate event of animals getting caught in soda can plastic rings. But since they were aboard the OSO catamaran, they had the fortunate opportunity to expand their knowledge. The students got a chance to learn about how compasses work and they were able to test out their newly found knowledge into action. 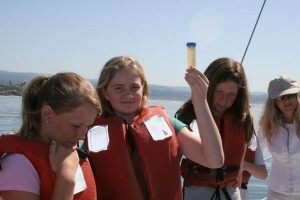 The students were also able to reel in a sample of ocean water and observe the plankton that were present. Once the boat ride ended, the students then gathered inside the OSO building to continue their learning experience. Inside, they got to map out their measurements taken with the compass, view the plankton under the microscope, and learn more about pollution. With this full day of activities, it is safe to say that Radcliff Elementary School’s fifth grade class got to experience a once in a lifetime opportunity. 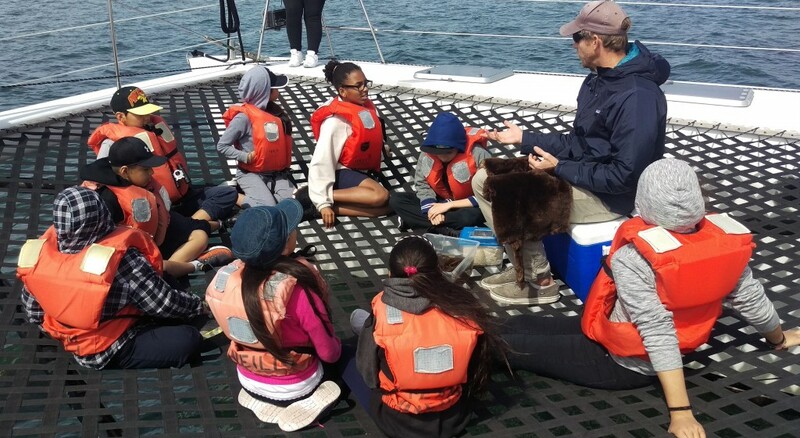 Not only did they learn more about the ocean and its inhabitants, but they had the opportunity to put their knowledge to the test with hands on activities on the boat and back inside the classroom. 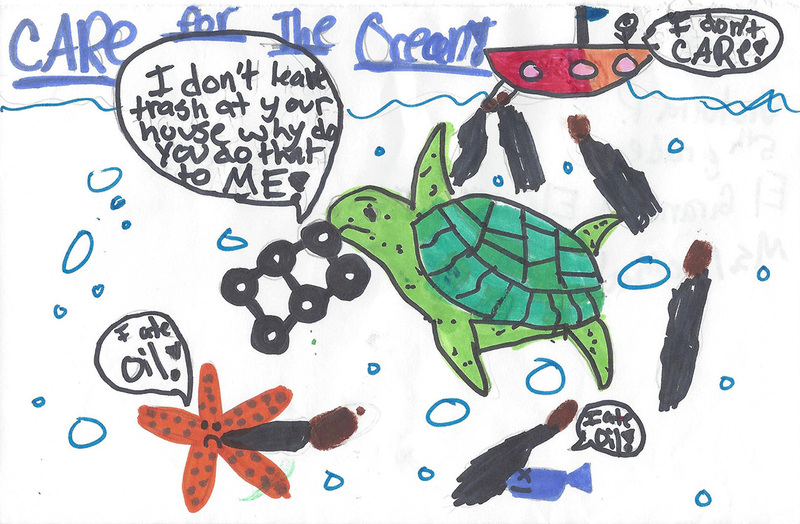 It’s great students such as them that will be future spokesmen of ocean awareness! A new school year means new students. However, there is one factor that has always remained the same. The smiles that come aboard the catamaran. Considering that OSO just celebrated their 20th anniversary, there is plenty to smile about. With plenty of experience under the crew’s belt, these students are far from receiving a mediocre experience. The students always find themselves having an amazing time looking at sea otters, touching kelp, capturing plankton, and taking bearings. The goal of this year, as it has been for the past 20 years, is to ensure a learning experience unlike any other and to keep the students coming back for more. We will be striving for a successful 2016-2017 school year! O’Neill Sea Odyssey’s 20th Anniversary Celebration – The Ocean Is Alive – raised $75,000 and counting…many thanks to those who made it happen! Committee Members: Andrea Graham (Chair), Tatiana Burdiak, Adam Steckley, Jim Thoits, Bridget O’Neill, Liz Kroft, Kelly Leo, Alexah Hart, Laura Barnes, Kathleen O’Neill. Sponsors: Union Bank, Bank of America (Gold); PG&E (Silver), Santa Cruz Beach Boardwalk, AEI Consultants, Inc., McNaught Fine Art, and Morgan Stanley (Bronze), KSCO – AM (Media). Emcee: Lex Van Den Berghe. Video producers: Joyce Anderson and Yamal Duryea. Donors: Annieglass, Bargetto Winery, Beau and Stacey Vrolyk, Bidwell House Bed and Breakfast, David Jochim, Jochim Family Foundation; Bonny Doon Vineyards; Cymber, harpsist; Bill Simpkins, Hunter Hill Vineyard & Winery; Samba Stilt Circus; The Wave Tones, HOLA – Bank of America employee volunteer group; Pleasure Point Design; Cafe Cruz, Cruz Car Wash, Daniel and Krista Fontis, Discretion Brewery, Doug Jones, Dr. James Beckett, Dream Inn, Ed Durkee, Ed Martinez, Harmony Hotel, Hilton Scotts Valley, Jackie Nunez, Jeff and Jill Bettencourt, Elyxir Distributing; John F Hunter Photography, Goodwill Central Coast; Lex Van Berge, Private Vine Wines, Yamal Duryea, Rachel Kippen, Joyce Anderson, SUP Shack, Snazzy Productions, Sean Walker, Santa Cruz Waves, Save The Waves, Om Gallery, O’Neill Surf Shop, Richard and Mary Morrison, Palapas Restaurant and Cantina, Rocky’s Personal Training, Santa Cruz Mountain Winegrower’s Association, Earth-In Canteen, Emma Hurley, Greenspace, Santa Cruz Warriors, Karen Nevis Fine Art, Kayak Connection, Khordz Mugs, Kim Thoits, Kuumbwa Jazz Center, Lance Wexler, Lisa Ekers, Lundberg Studios, Michael and Theresa Coyle, Modern Life, Ron and Diane Graves, Monterey Bay Aquarium, Nat Young, Nikki Brooks Photography, Pelican Ranch Winery, Santa Cruz Warriors, Rob and Nancy Bremner, Santa Cruz Yoga, Yvonne Rew-Falk, Shawn Dollar, Devcon Construction, Slowcoast, O’Neill Yacht Charters, Kim Thoits, Eastside Eatery, Cruz Control Designated Drivers, and North Coast Brine. Volunteers: Alexah Hart, Nikki Brooks, Laura Vandenberg, Sydnie Moore, Julia Schubert, Kelly Garbarino, Karina Gonzalez, Carole Bishop, Sue Dayton, Juanita Sanchez, Tom Wilson, Jules Holdsworth and Lauren Hanneman, Sandra Faith, Angie Luna, Lisa Crivello, Cindy Hawkins, Wendy Lopez, Rhonda Dunn, Alison Souza. Our 20th Anniversary is coming up Saturday September 17th from 6-10pm at the Seymour Center at Long Marine Lab! 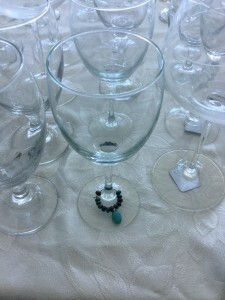 At our 20th Anniversary event, there will be food and drinks, and each guest receives a commemorative, repurposed wine glass. For entertainment, Samba stilt dancers and harpist Cymber Lily Quinn will be livening up the night with their marvelous talents. In addition to all the festivities, Joyce Anderson created a wonderful video to be shown at the event. The brilliant Anthony McNaught will auction Ed Martinez’ metal sculpture “The Ocean is Alive,” and 6 nights at a beautiful Maui condominium or 5 nights in Napili, Maui. There will also be a Walton Lighthouse Tour, a sail for six on David Crosby’s former boat The Mayan, a surfboard signed by Nat Young, 7 days at Harmony Hotel eco-resort in Costa Rica, and much more! And a special thank you to PPD Multimedia, Inc.
Click here to purchase tickets and T-shirts online before the event! To learn more about the event, visit oso20th.org or click here! 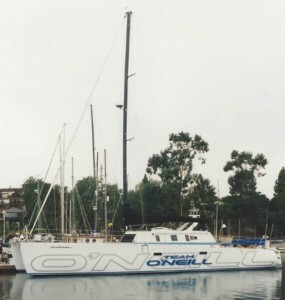 By 1996, the catamaran began to play a central part in Jack O’Neill’s vision to take youth on to Monterey Bay to learn about the marine environment. The vision took shape when Tim O’Neill began to work with Jim Holm, Carl Keehn, Mike Egan, Theresa Coyle, and Jack McLaughlin, among others, to develop a school science program. The first two first classes were held in 1996 when Peggy Marketello, who taught at Mountain School, brought classes down to the Santa Cruz Harbor to pilot the new program. That next year, as the program grew in small steps, a newly organized board of directors put together a case for state and federal recognition as a nonprofit. And in 1999, Dan Haifley became the director of OSO. In 1999, Tom and Judy Webster established the Adam Webster Memorial Fund for special needs youth to participate in the program. Jack O’Neill and Harry Hind donated the O’Neill Building at the Santa Cruz Harbor to the non-profit organization in 2000, to provide a shore-side education center and some revenue for the program. 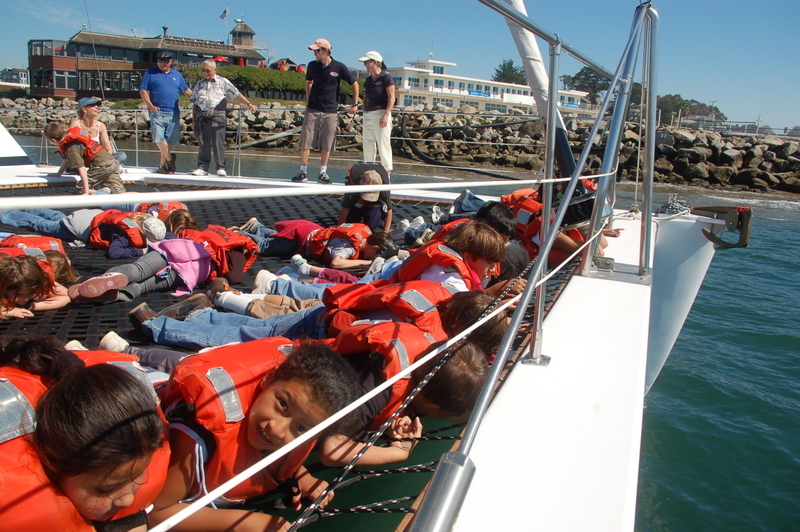 In 2003 O’Neill Sea Odyssey published a curriculum handbook including a chart with alignment to California State and Federal education standards, and distributed it nationally in collaboration with the national marine sanctuary program. O’Neill Sea Odyssey received the Governor’s Environmental and Economic Leadership Award in 2004, the same year that $1.3 million in donor funds plus a $200,000 loan re-built upstairs of the O’Neill building to accommodate a new education center (including an elevator for equal accessibility) and the Surfrider Foundation Santa Cruz Chapter’s water quality lab, while the downstairs reverted to the Santa Cruz Harbor. In 2006 the organization began paying for bus transportation for lower income schools, the same year it received Senator Barbara Boxer’s Environmental Champion award. In 2008 OSO installed its solar system for its education center and the Surfrider Foundation. 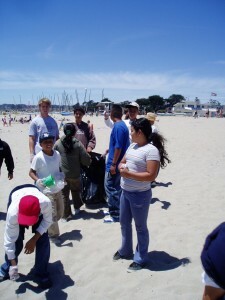 In 2009 the Adam Webster Memorial Fund received the Community Spinners award, in 2012 OSO’s curriculum was aligned to Ocean Literacy principles and distributed throughout California. The Silicon Valley Business Journal’s Community Impact Award was received in 2013 and the study of program’s long term impact on students was completed. In 2014 the program’s curriculum was aligned to California’s newly adopted Common Core & Next Generation Science Standards. In 2015 the program completed its transition from paper and clipboard collection of data on Monterey Bay to the use of iPads and a custom app, and has also filmed three classes and subsequently produced a “virtual program” for school classes that cannot physically get to the Santa Cruz Harbor but can benefit from the program. To read more about the history of OSO read Dan Haifley’s article by clicking here. For more about the program, read Laura Barnes Walker and Liz Kroft’s article by clicking here. Earth’s climate has always been changing, so what’s the big deal? Overall, humans contribute to climate change–whether climate change started occurring naturally or not–from the huge increase in greenhouse gas emissions that we have been persistently creating. To the right are two charts from the Environmental Protection Agency. 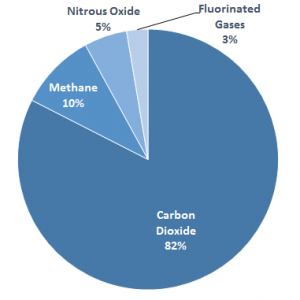 The chart on the left shows the percentage of greenhouse gases emitted in the United States. 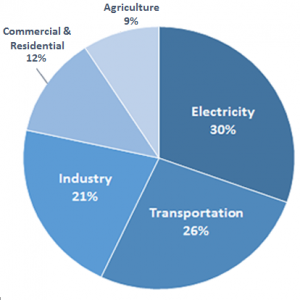 The chart on the right shows an overview of the sources of greenhouse gases in the United States (3). The total greenhouse gas emissions recorded by the EPA in 2014 were 6,870 million metric tons carbon dioxide (CO2) equivalent (4). The charts provide a visual understanding of the amount of carbon (CO2) released in the atmosphere from human activities. So where does all of this carbon go? 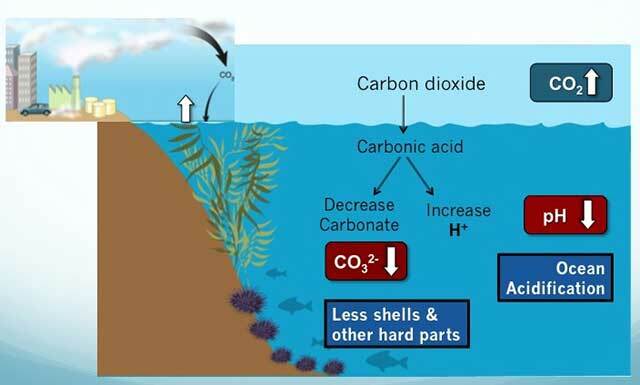 The ocean absorbs about ⅓ of the CO2 that is released into the atmosphere, consequently, stirring up problems within our ocean (5). How does climate change affect the ocean? “Climate change’s effects on the marine environment, including warming seawater temperatures, ocean acidification, sea level rise, and changes in currents, upwelling and weather patterns, have the potential to cause fundamental changes in the nature and character of marine and coastal ecosystems,” (5). 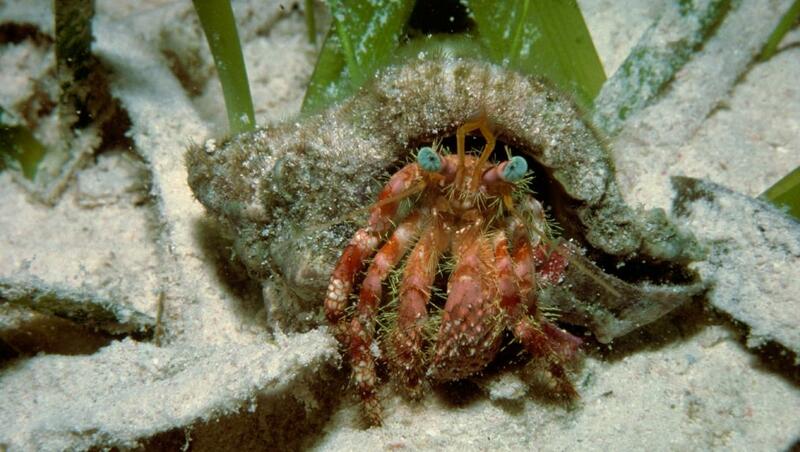 The CO2 absorbed in the ocean creates a chemical reaction that lowers the pH level, making the ocean more acidic–harming many ocean organisms, like the hermit crab in the photo below (5). To learn more about hermit crabs, click here. In addition to ocean acidification, the ocean is increasing in temperature–disturbing its delicate balance. 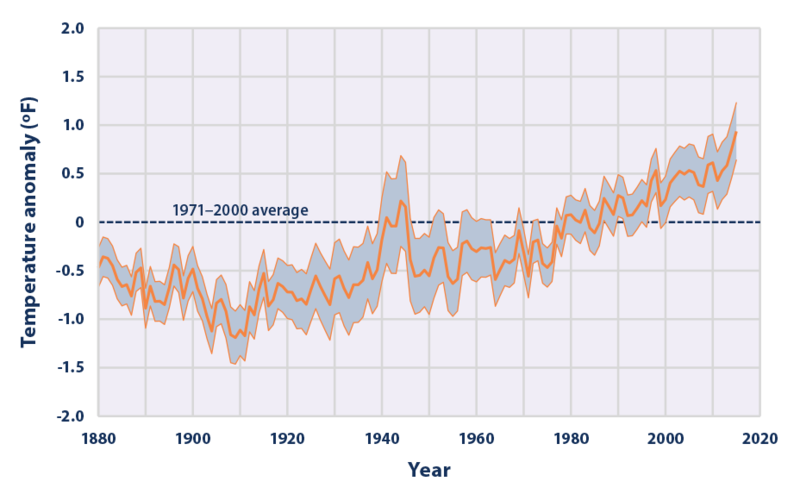 The graph to the right, provided by the EPA, clearly shows the rise in ocean surface temperatures (6). These temperature increases affect the depths of the ocean that marine life thrives. An example of an organism that has been affected is coral. The coral reefs depend on certain ocean temperatures in order to have the symbiotic relationship with algae that it requires in order to maintain a healthy reef (7). When the temperature of the ocean increases, coral reefs die off from coral bleaching (7). Furthermore, the rise in ocean temperatures also cause the ocean to expand–which makes the sea level rise–and creates stronger and more frequent storms (7). Equally important, ocean warming is causing ocean deoxygenation. This phenomenon is the decrease in oxygen in the ocean; oxygen levels have decreased by 3-6% in the 21st century (8). “Oxygen plays a key role in structuring marine ecosystems and controls the distribution of essentially all marine organisms,” (8). With ocean surface temperatures rising, ocean mixing is reduced–preventing the oxygen that is either created or absorbed on the surface from mixing with the rest of the ocean (9). The warming of the ocean and atmosphere also causes the polar ice caps to melt, leading to more freshwater–which is lighter in weight–entering the ocean (9). This is an additional cause for the surface of the ocean to be unable to mix, depriving various forms of sea life of oxygen. To read more about ocean deoxygenation, see references (8) and (9). As we learn more about the ocean, we find that the ocean has a very delicate balance like most other ecosystems. When one factor is disturbed, even what seems to be a small amount, a domino effect occurs–creating large-scale impacts. As a human species, evidence has unequivocally shown that we are indeed contributing enormously to climate change. If we continue to create this change in the environment through our actions, the impact will negatively affect most organisms on the planet, including us. Want to help? Click here to see how you can do your part to act against climate change. The California Plastic Bag Ban Referendum will be on the November 8th, 2016 ballot. Voting “yes” on Proposition 67 supports the ratification of the plastic bag ban in California under the name Senate Bill 270. O’Neill Sea Odyssey’s Board of Directors has voted to endorse Proposition 67. What will it do for California? It will “Prohibit large grocery stores and pharmacies from providing plastic single-use carryout bags and ban small grocery stores, convenience stores and liquor stores from doing so the following year.” However, it will still allow for single use plastic to be used for meat, bread, produce, bulk food, and perishable items. Prop 67 will also mandate stores to charge 10 cents for a more sustainable bag choice (consumers who are being assisted by the California Special Supplemental Food Program will be exempt from this fee). In addition, $2 million will be given to state plastic bag manufacturers to transition to the production of reusable bags and for the purpose of retaining jobs. Why is the plastic bag ban important? Banning single-use plastic bags will drastically reduce the amount of plastic that ends up in our ocean, on our beaches, in our parks and neighborhoods, in our mountains, and in our forests. Single-use plastic bags are lightweight and travel long distances by wind and/or are washed down creeks and storm drains (which lead to the ocean). Students in our program have seen first-hand, through taking samples out on the catamaran and then viewing them under a microscope, that in every drop of water in our bay, there are pieces of plastic. These pieces of plastic are called “microplastics,” and they result from the degradation of plastic into smaller fragments. To learn about how these microplastics are harmful to us and the environment, click here. Proposition 67 will not only decrease the amount of plastic that litters our state and the oceans that surround it, it will also save our state and communities tens of millions of dollars spent on litter-cleanup costs. Are you excited to take some action to protect California from the dangers of single-use plastic bags? Share your knowledge and get ready to vote “YES” on Prop 67! For more information on Prop 67 visit ballotpedia.org by clicking here. Click here to see the Surfrider Foundation’s 10 Reasons to Vote Yes on Prop 67 for a California Bag Ban. 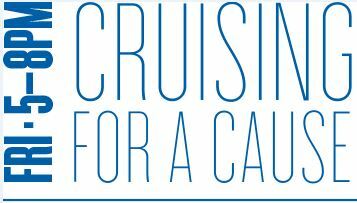 Cruising for a Cause Charity Night! West Marine is hosting a Charity Night to raise funds for local organizations in the Santa Cruz-area community for a grand opening of their new store location in Santa Cruz. There will be food, beverages, live music, fun and festivities for the participants to enjoy! 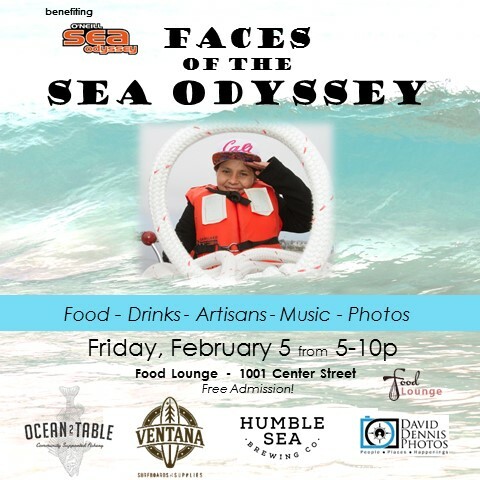 This event is bringing a great opportunity for local non-profit organizations, including O’Neill Sea Odyssey, to raise funds for their programs and gain exposure in the community. They are expecting to have 200-300 people attend the event, encouraging the non-profits to interact with community members while educating them about the programs. West Marine will be donating 50% of its sales for the night (up to $10,000) to the participating organizations. 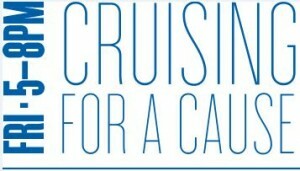 If you are interested in attending Cruising for a Cause Charity Night, we are selling tickets for $10 a piece. 100% of the proceeds from our ticket sales will go to fund O’Neill Sea Odyssey! To buy tickets from us please click here, or email Dan Haifley at dhaifley@oneillseaodyessey.org or call (831) 465-9390. To learn more about event details visit westmarine.com/santacruz. Hope to see you there! 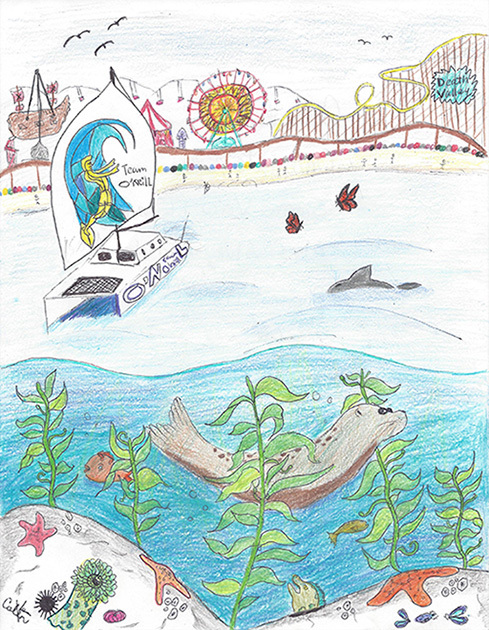 Santa Cruz, CA, August 1, 2016 – O’Neill Sea Odyssey (OSO) and its Board of Directors are proud to announce the winners of the 2015-2016 Ocean Steward Art Contest. 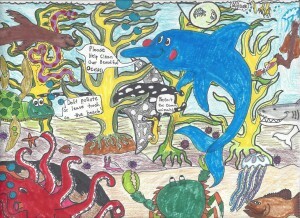 Kate & Jenna Shute (grade 5), of Happy Valley Elementary in Santa Cruz, CA, are the grand prize winners. Kate & Jenna and their teacher, Caroline Frier, will each receive passes for a one-hour public sail aboard the Team O’Neill catamaran. The four honorable mention winners include: Ariel Taylor (grade 6), of Mountain Elementary in Soquel, CA; Jack Galbo (grade 5) of Mountain Elementary; Sienna Walczak (grade 5) of Live Oak Elementary in Live Oak, CA; and Ruby Beye (grade 6) of Mountain Elementary. These five students will all receive recognition through OSO’s web blog, social media and newsletter. Their artwork will also be exhibited in the OSO classrooms. In honor of Kate & Jenna Shute and their award winning piece, “Deep Sea Water World,” O’Neill Sea Odyssey will present an enlarged mounted copy of the artwork to both Happy Valley Elementary and Bank of America, who provided funding for Miss Frier’s class. 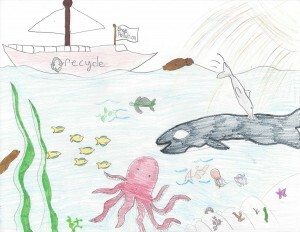 2015-16 Winning Announcement and more information about OSO’s Ocean Steward Art Contest. In preparation for OSO’s 20th Anniversary celebration on September 17th, Goodwill Central Coast kindly donated 327 wine glasses. We’re expecting around 300 people to celebrate 20 years of wonderful accomplishments at the Seymour Marine Discovery Center in Santa Cruz. These wine glasses come in all shapes, sizes and colors — quite the eclectic mix. Washing these wine glasses was made possible by the Crow’s Nest, many thanks to the employees who helped with the washing! Now the glasses are packed and ready for the grand celebration coming up here in a few months, hope to see you there! For more information about OSO’s 20th Anniversary visit our site here! Students from Watsonville Charter School of the Arts have created an amazing video about ocean plastic pollution – check it out here ! Enjoy! O’Neill Sea Odyssey’s 20TH year anniversary celebration will place on Saturday, September 17, at the Seymour Marine Discovery Center in Santa Cruz. We would be honored if you would help us celebrate our 20TH year anniversary – an elegant evening of art, hors d’oeuvres, cocktails, music, and an auction. You can make your reservation at http://oso20th.org . We hope to see you there! Who doesn’t love soaking up the sun’s rays and being outside? Janitza Mendoza, a student at Live Oak Elementary, made it clear that outdoor education is the best way to engage a student. After her experience here at OSO, she took it upon herself to look up facts and studies based on her thoughts about education outside of the classroom. Not only did she find that being outdoors relieves stress but she found out that the outdoors helps students with their self-esteem and motivation in school. The hardest part of education is getting students motivated to learn. That’s why it is always great to receive feedback from those who attended OSO’s program. It’s helpful to us because we find out that students are gaining more than just facts about marine life, they are gaining a once in a lifetime experience that changes them for the better. The students here get to learn outside and this is something that they don’t do very often. This encourages the students to learn more about the outdoors and to spend more time outside. It even gets them to do research about it! O’Neill Sea Odyssey gets a wide arrange of letters and art from the students who board the catamaran. Although they may not seem like much, these drawings and letters can be considered the student’s own version of a scientific journal and diagram. 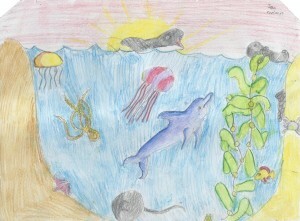 From zooplankton to California sea lions, the students really illustrate their knowledge of the inner workings of ocean life. Some even ask scientific questions! 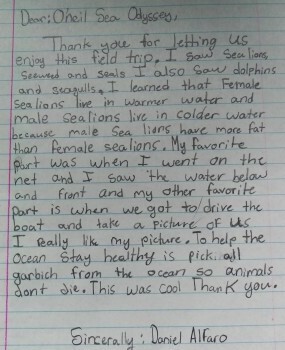 The amount of facts and ecological concepts that the students display in their letters is a direct result of their experience on the catamaran. This lets the team here at OSO know that they are impacting the lives of every student who boards. As we approach the 20th anniversary of OSO, we can hope to inspire many more students to come. In return, we hope that these students can apply their understanding of the ocean into their daily lives and into their goals for the future. Everyone put on your jackets because rain has made its way into Santa Cruz! The team at O’Neill Sea Odyssey did just that when rain decided to show up on Friday, May 6. The small sprinkles turned into a hard drizzle when the 5th graders from Amesti Elementary School boarded the catamaran. With life-jackets on and ponchos put over, these students were ready to take on the rain. Although the weather was unplanned, it did not affect any of the activities planned for the day on the boat. 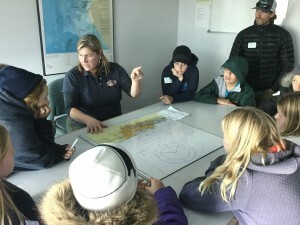 The children still formed small groups and rotated through the three learning stations, which include marine biology, marine ecology, and navigation. Even with wet clothes and squeaky shoes, students were still engaged and thrilled to be on the catamaran experiencing this sailing classroom. It almost seemed as if the rain made their experience just a little more exciting! One of the key components of O’Neill Sea Odyssey’s lessons is the viewing of plankton collected at sea. That viewing occurs in the marine biology lab, or the Balance Vector Room, in our Education Center at the Santa Cruz Harbor. 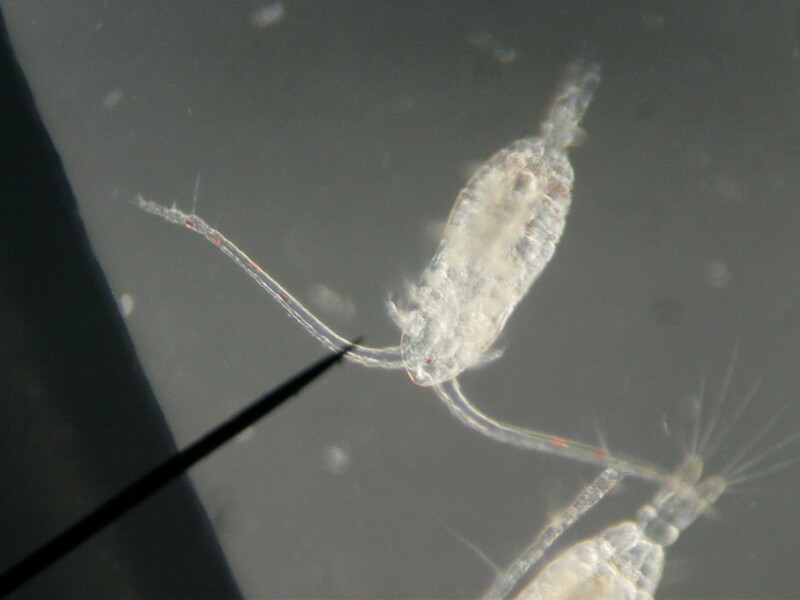 This Copepod, pictured above, was swimming around a drop of water placed on a slide under our microscope, illuminated for the entertainment and education of our students, on a day not too long ago. 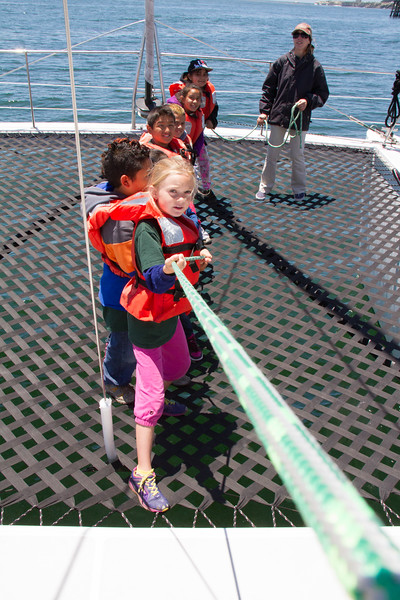 Students from Green Acres School pass Santa Cruz “Mile” Buoy before they collect plankton on Monday, 4/18. 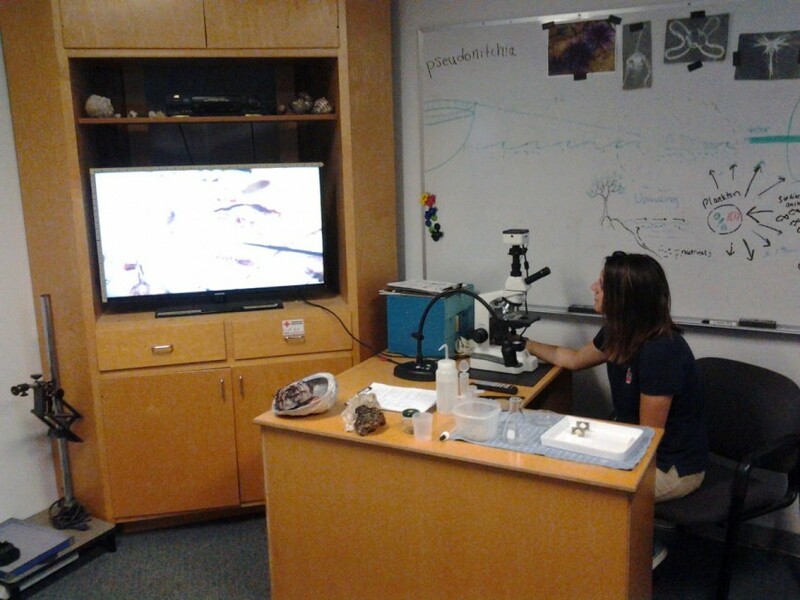 The Santa Cruz County Fish and Game Advisory Commission provided a grant for a new microscope to view our daily plankton find. Here is a photo of instructor Marina Maze looking over a sample from this morning’s class. As many of you know, the harbor entrance has been closed due to shoaled sand for many months. During the first week of March we were anxiously awaiting updates on the harbor entrance, hoping that the channel could be cleared by our start date of March 8th. Unfortunately the harbor remains shoaled today, being far too shallow for a boat the size of the O’Neill Catamaran to pass. However, we are still providing programs to schools. 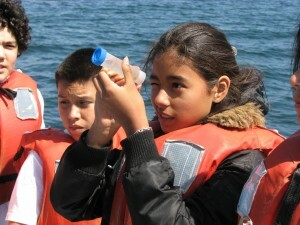 The OSO program is not just a boat ride, but a comprehensive marine science education program. We have been able to modify our program to use the boat dockside and include all of the educational components that make our program so effective. While we would prefer to give our students a tour of the bay we are at the mercy of the weather and the harbor dredge protocol. We are making the best of a difficult situation by focusing on the positive and providing the best possible educational program that we can. We thank our student, teacher and parent participants for their patience and we are ready to get back out on the bay as soon as we are able. The faces of children learning the fundamentals of science and environmental stewardship while sailing Monterey Bay will be the subject of renowned, local photographer David Dennis’s reception and show, “Faces of the Sea Odyssey,” from 5:00 to 10 PM on Friday, February 5 at the Food Lounge Santa Cruz, 1001 Center Street. Admission is free. O’Neill Sea Odyssey, the non-profit organization which has served more than 85,000 elementary school children from the region with an ocean-going science and environmental education program, will be the beneficiary of the show. 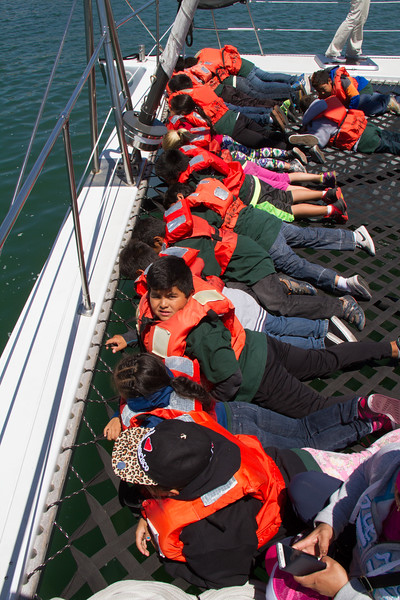 The photos will be of students who sailed on June 23, 2015 from the Nueva Vista Community Resources (formerly Beach Flats and Familia Center) in Santa Cruz and a class of students with special needs from Buena Vista School in San Jose. Music will be provided by Trio Guadalupano. Local food, beverage and artisan vendors will include Twins Kitchen, Ocean 2 Table, Cali Maple Designs, Ventana Surfboards & Supplies, Sarah Broome, Chris Allen and Humble Sea Brewery. OSO was founded in 1996 by wetsuit innovator and surfer Jack O’Neill. 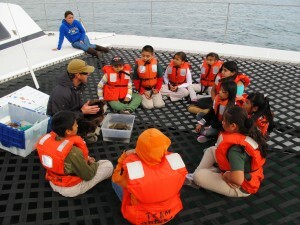 A living classroom was created on board a 65-foot catamaran sailing the Monterey Bay National Marine Sanctuary where 4th – 6th grade students from schools throughout Central California receive hands-on lessons about the marine habitat and the importance of the relationship between the living sea and the environment. David is a philanthropic photographer, co-founder of Ventana Surfboards & Supplies and a Director of Product Management at Microsoft. He lives on the Westside of Santa Cruz with his wife and two kids. To learn more, go to: Facebook Event Page. 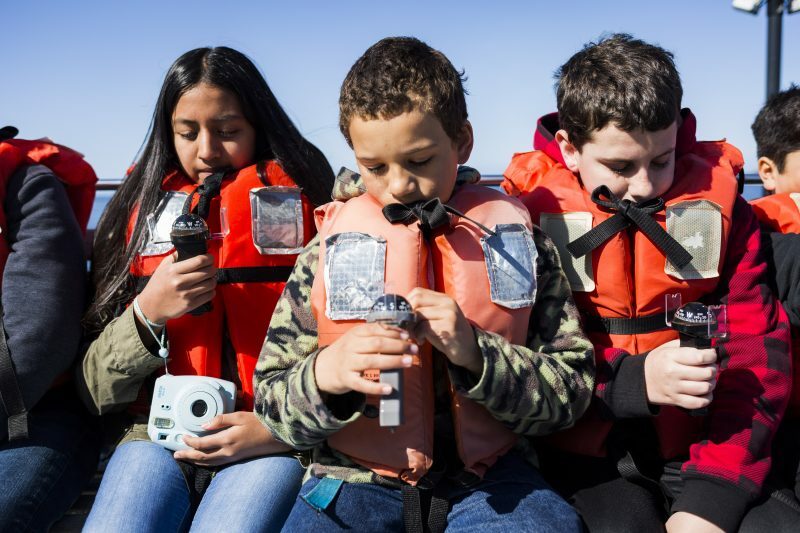 Applied Survey Research (ASR) has completed its evaluation of student survey results for O’Neill Sea Odyssey’s (OSO) program for the 2014-15 school year and found that the free, ocean-going science and ecology program had a high impact on participating youth. Between July 2014 and June 2015, 5,519 students in 207 classes participated in the program. The OSO Student Survey showed that the program was effective in promoting substantial increases in students’ environmental awareness. Before participating, an average of 76% of students agreed with the survey questions overall. After attending the program, this percentage increased to 96%. When student surveys were divided by income level, results showed that all groups of students increased their environmental knowledge after attending the program. The students from lower and middle income groups generally had lower overall levels of agreement before the program started than the higher income groups. Our classroom loves to be outside especially on your boat! Our classroom is full of students who have very special gifts. These gifts are mostly present in their smiles. Their faces tell the story and their story brightens every heart that comes close. When we are outside working in our garden the world is a better place for all of us! When we ride the O’Neill Sea Odyssey and get to become scientist, the opportunity is pure magic! Thank you again and again for providing this incredible experience for our students and their families! The feel of the wind, the sail, the sparkles, the otters, the waves, the kelp, the blue of the bay and your amazing crew will be with us forever! Thank you for enriching our lives in ways way beyond our wildest dreams. Words escape many of my students. For us, a picture is indeed worth a thousand words. When students take their own picture they can tell their own story. As we share our stories and pictures, we can recall our history and authentic learning happens. Thank you for supporting and building these glorious lasting memories! O’Neill Sea Odyssey wishes to thank System Studies Team Giving for their gift of $5,000 to the Adam Webster Memorial Fund, established by Tom and Judy Webster in 1999 in memory of their son, Adam. Pictured below are OSO Executive Director Dan Haifley, Becca Mosley of System Studies, Tom and Judy Webster, and Sheryll Hiatt of System Studies. DONATE TO OSO THROUGH MONTEREY COUNTY GIVES! Your gift to Monterey County Gives! 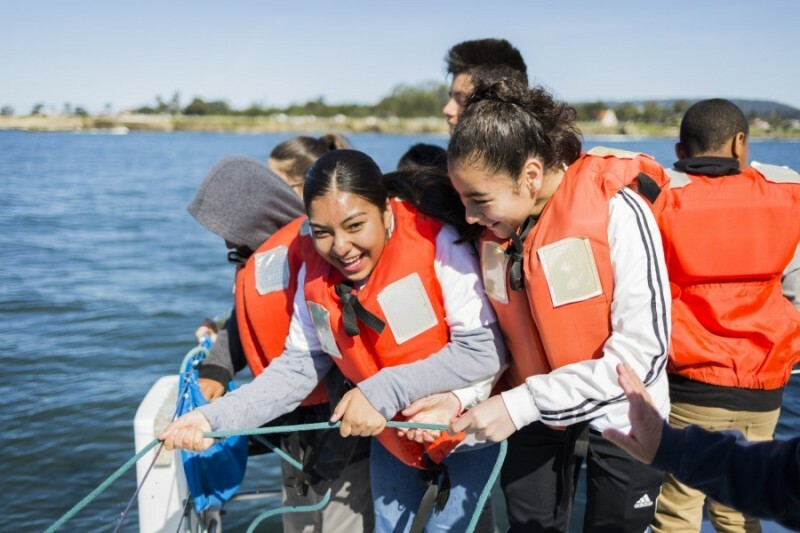 will support those student’s participation in O’Neill Sea Odyssey’s free, ocean-going science and environmental education program if you give at Monterey County Gives!. Thank you! From 5 to 6:30 PM on Thursday, December 3 in the Crow’s Nest Harbor Room, the 4th annual Holiday Lighthouse Ceremony & Celebration will be held to benefit O’Neill Sea Odyssey (OSO). The event will cost $50 per person, payable at the door. Space is limited and RSVPs are required. The event is being organized by OSO Advisory Board member Bill Simpkins and OSO Board member Jim Thoits. 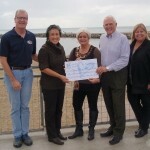 The pair had also spearheaded the fundraising drive for the Walton Lighthouse at the Santa Cruz Harbor. Some communities have holiday parades and tree lighting ceremonies. Two nights before the Santa Cruz Yacht Club’s Lighted Boat Parade, we thought we would start a new and uniquely Santa Cruz Harbor tradition: throw the switch to light up the Walton Lighthouse. Sunset will occur around 4:51 PM and the switch around after that time. Food and wine will be served. The event is being supported by System Studies Incorporated, PG&E, Bailey Properties, West Marine, Bill and Brigid Simpkins and the Crow’s Nest restaurant. To reserve your space, please email Dan Haifley at dhaifley@oneillseaodyssey.org by December 1. In 1999, Tom and Judy Webster established the Adam Webster Memorial Fund in honor of their son, who had enjoyed sailing with his parents. The fund has since served hundreds of special needs youth that earned it the Community Spinners Award in 2009 from the Special Parents Information Network. To see it for yourself, go to https://www.youtube.com/watch?v=P6nzwxuZG8c . Enjoy! On June 3, the California State Assembly approved Assembly Bill 988, by Assemblymember Mark Stone (D-Santa Cruz) and Assembly Speaker Toni Atkins (D-San Diego) by a vote of 73 – 3. The bill will now head to the State Senate. The bill would create a grant program to support outdoor environmental education and recreation programs within the California Department of Parks and Recreation. O’Neill Sea Odyssey’s Board of Directors has endorsed the bill in order to advance the field of outdoor, environmental education, which has relatively few institutional funding sources. Thanks to four young coders from UC Santa Cruz, the world of ocean science, and environmental activism is about to be unveiled just a little more to more than 5,000 elementary school students per year who participate in O’Neill Sea Odyssey’s (OSO) free ocean-going science and environment program. The programmers are Alexander Henry, Chris Hsiao, Brad Bernard, and Arjun Gopisetty who collectively call themselves The Plankton Guys. They were participants in Hack UCSC 2015, where they heard pitches by me and OSO’s education coordinator Laura Barnes asking for an app that would allow our students to collect and enter ocean data they could call their own. Up until recently, OSO used old fashioned clipboards and paper on the boat for data recording, which is done by the instructor. The data reflects oceanographic conditions and biology data at that point in time. Each class of 30 students is divided into three groups for a 10:1 student to instructor ratio. For the navigation, ecology and marine biology lessons on the boat, we record data three times, one for each group of ten students. The instructor recorded the data into our website after the class. Our current data collection and entry method was time consuming and does not engage the students. The data entry portal was difficult to navigate and use. OSO purchased the iPads to enable our students to record and enter the data directly into our website, both at the same time, water pH, wildlife counts, GPS coordinates, compass bearings, plankton species, and other information that we used to collect on clipboard and paper. Rather than replicate our paper-based data collection sheet, the app The Plankton Guys developed a graphic interface that makes data entry easier to do. It sends the data directly into the database on our website, through our existing data portal. But all the students will see is the cool app on the iPad. The goal is for data entry to be user friendly for the students, so they can concentrate on the significance and meaning of the data itself and not on how aggravating it is to enter it. OSO needs to raise an additional $7,000 to fully fund the project. 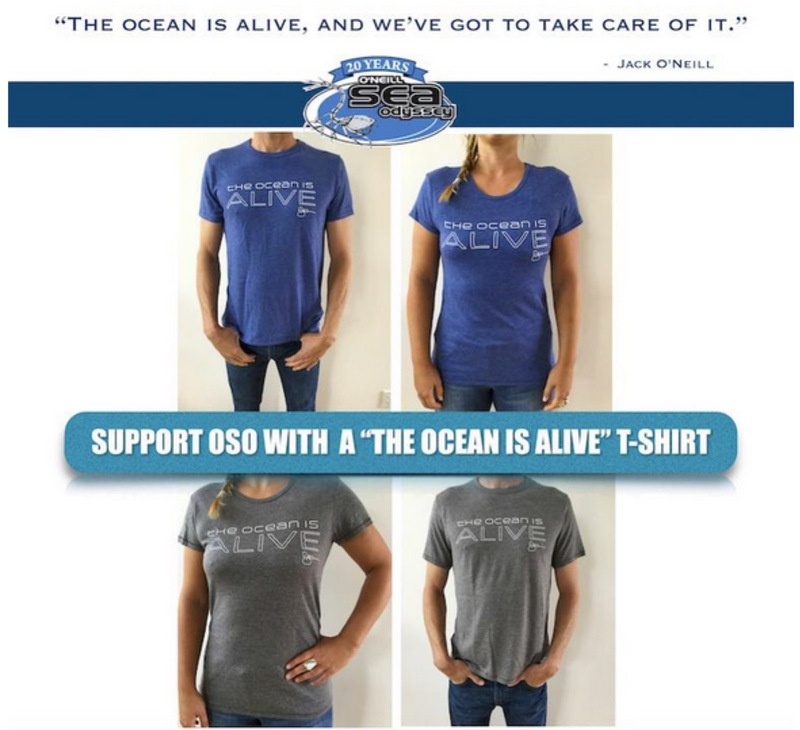 You can use the Donate Now button at oneillseaodyssey.org – thank you! 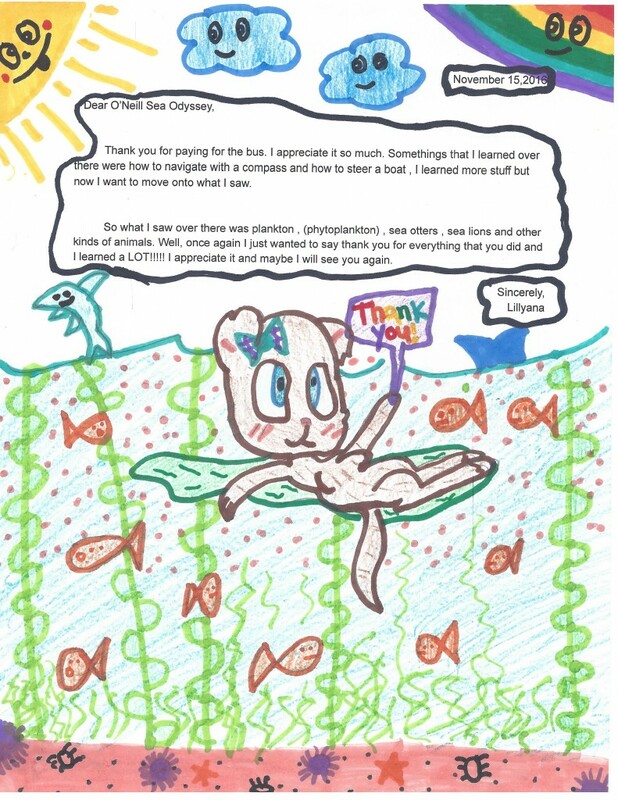 Last fall, 4th – 6th grade O’Neill Sea Odyssey (OSO) students were invited to submit their artwork to the Ocean Steward Art Contest – a creative interpretation of the watershed, marine and/or stewardship themes learned while attending the OSO program. On January 26, OSO and its Board of Directors announced the winners and awarded the efforts of the students, teachers, schools and communities. 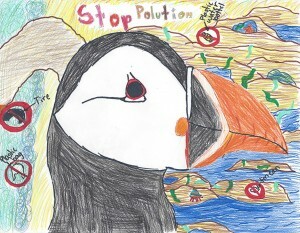 Victoria Preciado (grade 5), of El Granada Elementary in Half Moon Bay, CA, was the grand prize winner. “It delivers a visual and verbal message that speaks from the ‘ocean’s’ side of things – not our side,” said Mike McCabe, OSO Board Member. Miss Preciado and her teacher, Laurie McMahon, each received passes for a one-hour public sail aboard the Team O’Neill catamaran. In honor of Victoria Preciado and her award winning piece, “Care for the Ocean,” O’Neill Sea Odyssey presented an enlarged mounted copy of the artwork to both El Granada Elementary and Comerica Bank, who provided funding for Miss McMahon’s class. 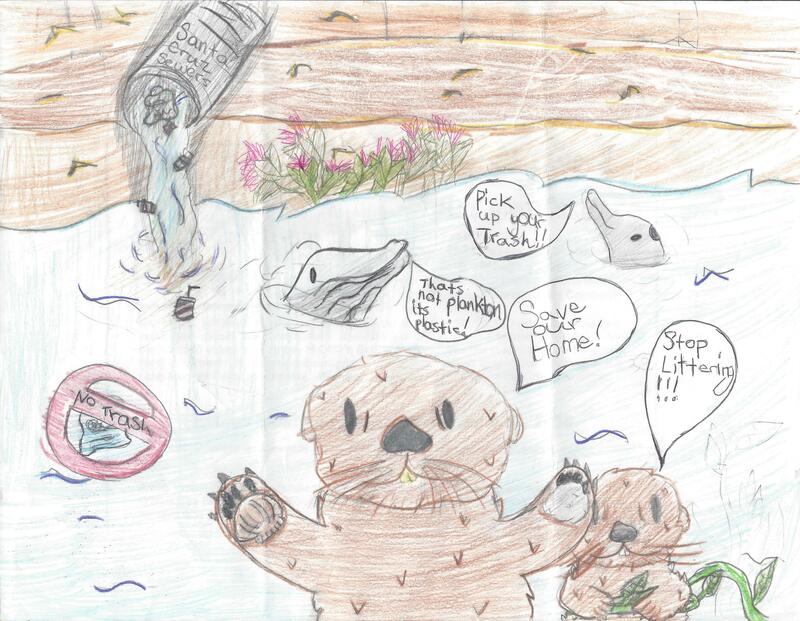 The three honorable mention winners included: Jazmin Sofia Zilla (grade 5), of El Granada Elementary; Naomi Naito (grade 5) of El Granada Elementary; and Molly Berman (grade 4) of Vine Hill Elementary in Scotts Valley, CA. Their artwork is currently on exhibit in the OSO classrooms. Congratulations! Applied Survey Research (ASR) has completed its evaluation of student survey results for O’Neill Sea Odyssey’s (OSO) program for the 2013-14 school year and found that the free, ocean-going science and ecology program had a high impact on participating youth. The ASR study measured the results of surveys of students administered before and after the program as well as the results of surveys completed by teachers whose classes participated in the program, and cross-analyzed them against demographic data about the participating schools. “We are pleased that the ASR analysis indicates that we continue to be effective at teaching ocean concepts across several subjects including math and science while inspiring environmental stewardship and advocacy”, said OSO Executive Director Dan Haifley. Between July 2013 and June 2014, 201 groups participated in OSO, representing 5,201 students, with an average group size of 27. It was estimated that 51% of the students attending the OSO program did not have English as their primary language, a slight increase since 2007-08. 59% of students qualified for the free or reduced price lunch program. Approximately 51% of participating groups were lower income groups, 26% were middle income groups, and 23% were higher income groups. 77% of all teachers/group leaders reported that they had used the online teaching materials provided on the website before their trip, and most teachers – 93% – intended to use the online teaching materials in the classroom after the trip. In every topic area, between 95% and 98% of classroom teachers or group leaders indicated that their students had “learned a lot.” 99% reported that their students had “learned a lot” from the overall learning experience. When student surveys were divided by income level, results showed that all groups of students increased their environmental knowledge after attending the program. The students from lower income groups generally had lower levels of agreement at 74% compared to 77% for middle income and 80% for higher income students before the program. But lower income students caught up with their knowledge, at 96%, compared to 97% for middle and higher income students, after the program. Julie Pollack, a special Education teacher at the Santa Cruz County Office of Education, brought her students out on the OSO program last May. 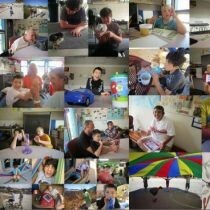 Please view this very special video, that shows the impact that OSO has on very special kids. From 4 to 6 PM on Thursday, December 4 in the Crow’s Nest Harbor Room (new location), the 3nd annual Holiday Lighthouse Ceremony & Celebration will be held to benefit O’Neill Sea Odyssey (OSO). The event will cost $50 per person, payable at the door. Space is limited and RSVPs are required. The event is being organized by OSO Advisory Board member Bill Simpkins and OSO Board member Jim Thoits. The pair had also spearheaded the fundraising drive for the Walton Lighthouse at the Santa Cruz Harbor. Some communities have holiday parades and tree lighting ceremonies. 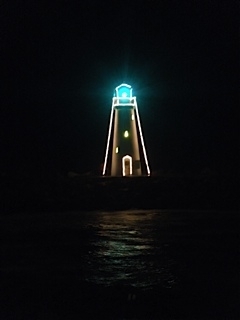 Two nights before the Santa Cruz Yacht Club’s Lighted Boat Parade, we thought we would start a new and uniquely Santa Cruz Harbor tradition: throw the switch to light up the Walton Lighthouse. We hope it will become a tradition for the Seabright and Live Oak neighborhoods. Sunset will occur around 4:51 PM and the switch around that time. Food and wine will be served. The event is being supported by System Studies Incorporated, PG&E, and the Crow’s Nest restaurant. To reserve your space, please email Dan Haifley at dhaifley@oneillseaodyssey.org by December 1. 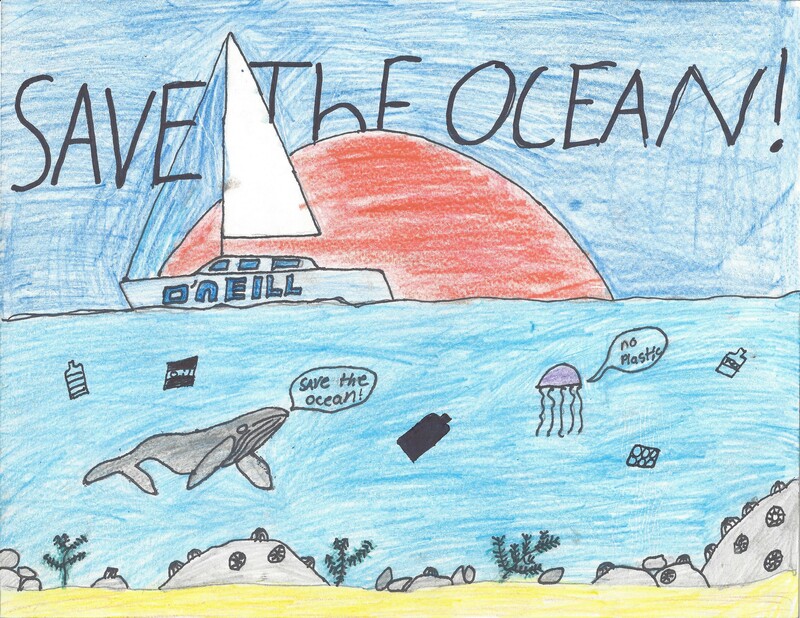 O’Neill Sea Odyssey students in 4th through 6th grade: Submit your artistic interpretation to OSO’s Ocean Steward Art Contest. Entries must be postmarked by June 30, 2016. Winners will be announced by August 2016 by email and here on the OSO blog. For more information and to complete a contest Entry Form click here. 75,000 youth and more to come! 75,000th student: OSO served its 75,000th student during its afternoon class on Tuesday, December 3rd. 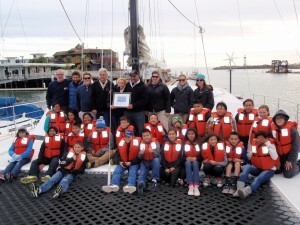 A certificate was presented to Stan Wyman’s 6th grade class from Bolsa Knolls Middle School in Salinas after they boarded the Team O’Neill catamaran. New survey measures what students learn: Education Coordinator Laura Barnes worked with Applied Survey Research to revise the logic model and the student and teacher surveys, which measure how well students learn the material we teach. OSO tested its new student survey between September and December of 2013. For the question “I know where storm drains lead”, 49.6% of students answered affirmatively before the program, and 96.7% afterwards, a 47.1% positive change. For the question “Most pollution comes from land”, it was 88.2% vs. 99.2%, for an 11% positive change. And for the question “I (will) share what I know about protecting the environment and ocean with my friends and family”, it was 59.2% vs. 94.1%, for a positive change of 34.9%. These results indicate that OSO has a profound impact on student understanding of and willingness to undertake environmentally responsible behaviors, and to advocate positive action to others relative to non-point source pollution. WeWrite and OSO collaborate on children’s book: The local publishing company WeWrite, located in Scotts Valley, specializes in books written by children, for children. Working with Jody Lust’s class from Gault Elementary School, WeWrite staff have produced a book entitled Trash Twisters, inspired by the students’ experiences at OSO. The story is an adventure featuring two children who learn about the importance of ocean conservation when they encounter a sea monster made of pollution while stranded on a tropical island. The book will be published in September 2014. Bus transportation: OSO distributed approximately $30,000 in transportation scholarships to lower income schools in 2013-2014. We anticipate an increase in requests next year, and OSO continues to raise funds to enable qualifying low-income schools to participate by funding their bus transportation. Silicon Valley Business Journal Community Impact Award: At a dinner ceremony on November 5th, 2013, O’Neill Sea Odyssey received the Silicon Valley Business Journal’s Community Impact Award. The Journal cited OSO’s innovation and work to introduce STEM (Science, Technology, Engineering and Math) subjects to students. Jack O’Neill Lifetime Achievement Award & Cowell Beach Mural: The Santa Cruz Chamber of Commerce bestowed its Lifetime Achievement Award on OSO co-founder Jack O’Neill for his contribution to ocean access and economic prosperity through his innovation of the wetsuit. A permanent mural was erected at Santa Cruz’s Cowell Beach, site of O’Neill’s original Santa Cruz Surf Shop, and a donation was made to OSO by O’Neill Wetsuits and the Santa Cruz Dream Inn to honor Jack’s legacy. The Dream Inn now hosts the Jack O’Neill Lounge, with a great collection of photos and collectables. 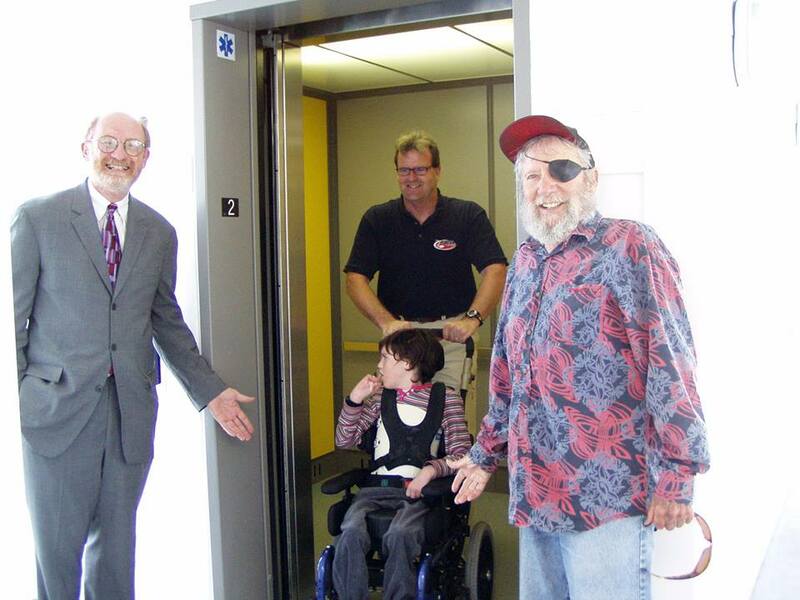 Special Needs Youth: OSO worked with Tom and Judy Webster, founders and supporters of the Adam Webster Memorial Fund, to update protocols for safely serving physically, cognitively, and otherwise challenged youth. State Legislation to Fund Environmental Outdoor Education: California State Assembly member Mark Stone (D-Scotts Valley) made the fourth serious attempt since 2003 to pass a state law to provide modest funding for qualified outdoor, environmental education programs, placing a priority on those that serve lower income youth and align with Common Core and STEM standards. OSO was a primary supporter of Assembly Bill 1603, and Executive Director Dan Haifley travelled to Sacramento to testify on its behalf and organized support for it. Unfortunately, the effort stalled due to budget concerns. Discussions are underway about trying again after fixing some of the problems encountered this past year. 2014-2018 Strategic Plan: At its September 2013 meeting, O’Neill Sea Odyssey’s Board of Directors approved a new, five-year strategic plan for 2014 through 2018. Under the new plan, OSO’s goals are to: 1) have served a total of 100,000 students with our hands-on, ocean going education program by the end of 2018, 2) continue to increase environmental stewardship and advocacy among youth through our hands-on, ocean education program combined with our promotion of ocean science curriculum and watershed concepts in classrooms, especially for inland schools, 3) achieve financial sustainability through the OSO endowment & building, and 4) continue to advocate for outdoor environmental education using O’Neill Sea Odyssey’s success as a model. 50 Years of Safe Harbor: The Santa Cruz Harbor opened in 1964 and OSO would not be in business without it. OSO staff have participated in anniversary events and Executive Director Dan Haifley has published “50 Years of Safe Harbor: A Short History —a collection of Santa Cruz Sentinel Our Ocean Backyard Columns” about the history of the Santa Cruz Harbor. Proceeds from the book benefit OSO. Community Support: From July 1, 2013 to June 30, 2014 OSO had revenues of $1,007,463, including $111,144 in rental income from private tenant spaces in the O’Neill Building, with the rest coming from generous donors and income from events like the December 2013 Lighthouse Lighting, and the September 2013 Taste of the Harbor. Our total expenses for the program and building were $966,532. A copy of OSO’s year-end financial statements are available upon request. 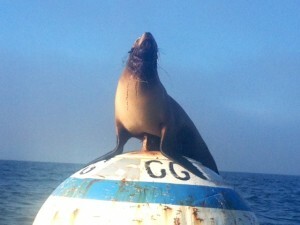 At 10:30 AM this morning, a California sea lion named O’Neill was launched off the Team O’Neill catamaran, the primary platform for O’Neill Sea Odyssey, near its home at the Santa Cruz Municipal Wharf, Seal Rock, and the US Coast Guard buoy. Its neck and head are now free of the netting and rope that had entangled them and had made it difficult for her to eat. Her predicament led to a series of phone calls and emails to the Marine Mammal Center in an effort to rescue and save her. Below is an email that we received from Laura Sherr of the Marine Mammal Center last week. In the meantime, we are so happy that O’Neill is home, safe, with her buddies. As you might read in the Santa Cruz Sentinel tomorrow, O’Neill is doing very well. We were able to remove her entanglement at our main hospital in Sausalito, CA. She may have some deafness as her right ear experienced serious trauma. Otherwise, she is doing very well and we hope to be able to release her in the next day or two. Please let me know if you’d like to know when we finalize her release date and time. It will likely be in Sausalito, CA, as we don’t want to stress O’Neill by driving her back to Santa Cruz. If any of you are able to make the trip, though, it would be great to have you there to witness the final step of this very long journey! Thank you so much for your support of The Marine Mammal Center, and thank you so much for the important work that your nonprofit does in spreading the word about ocean health!